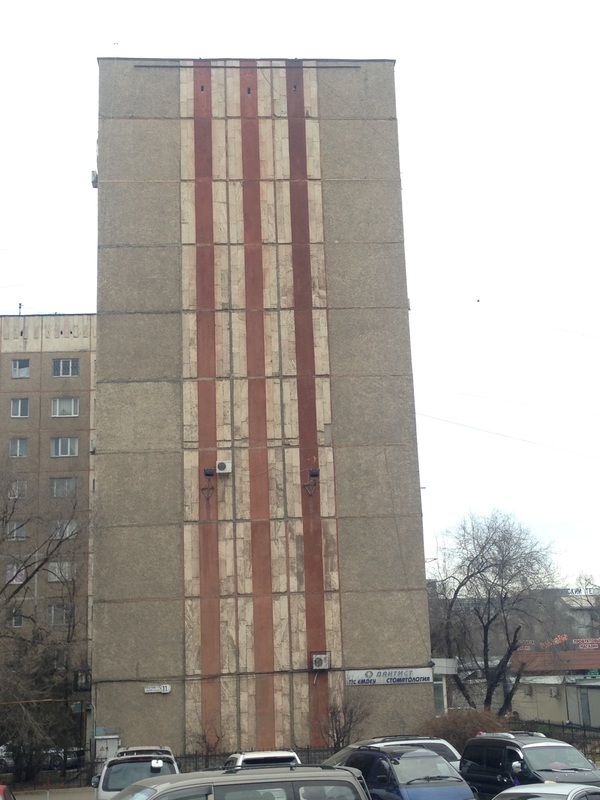 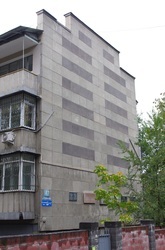 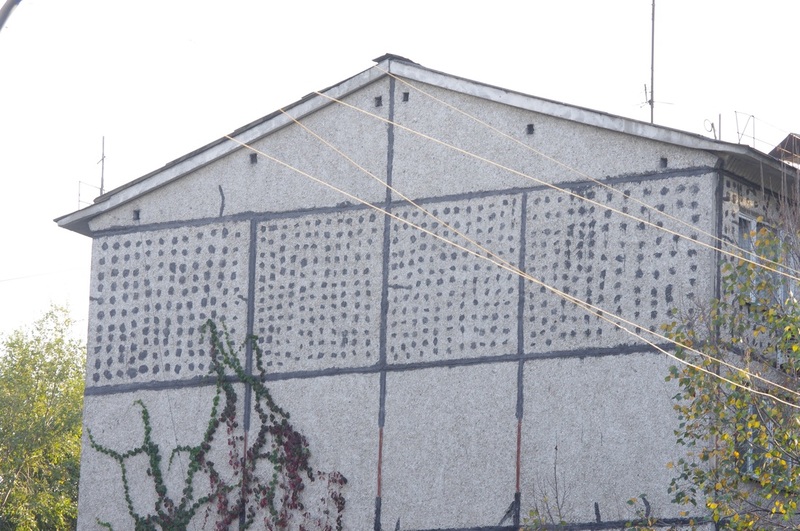 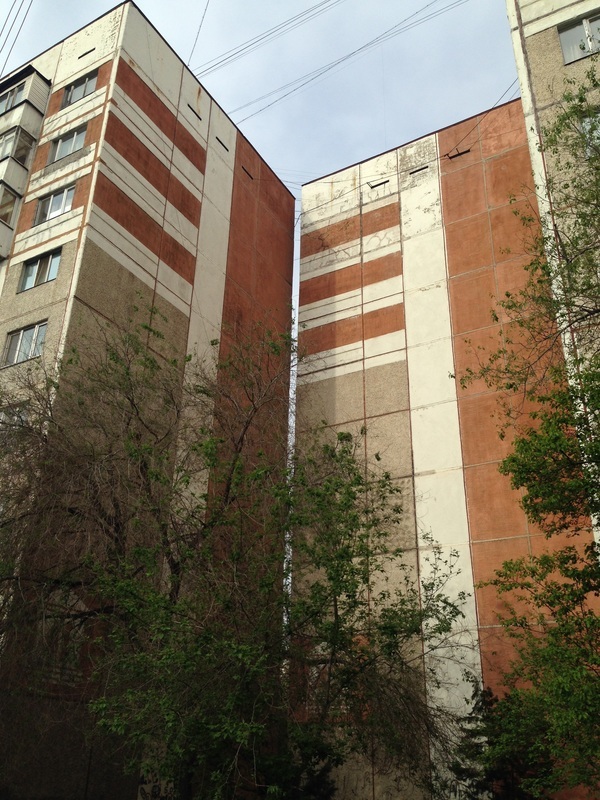 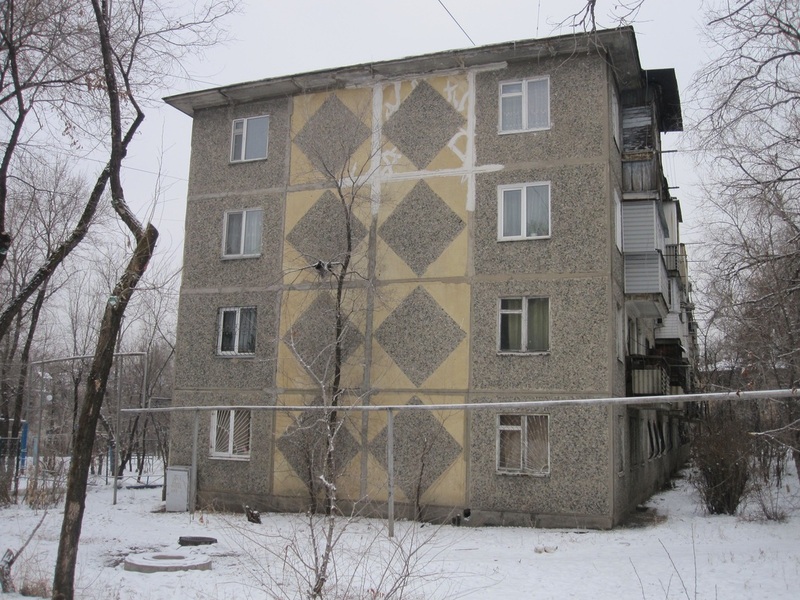 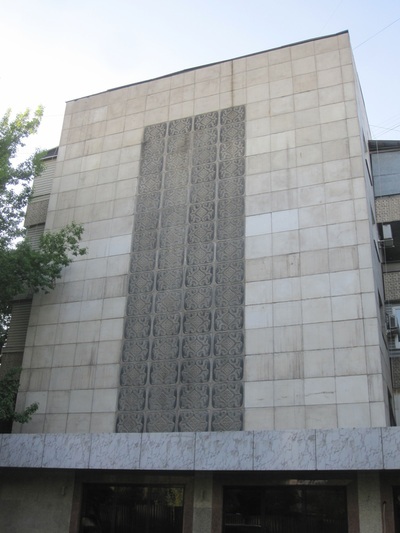 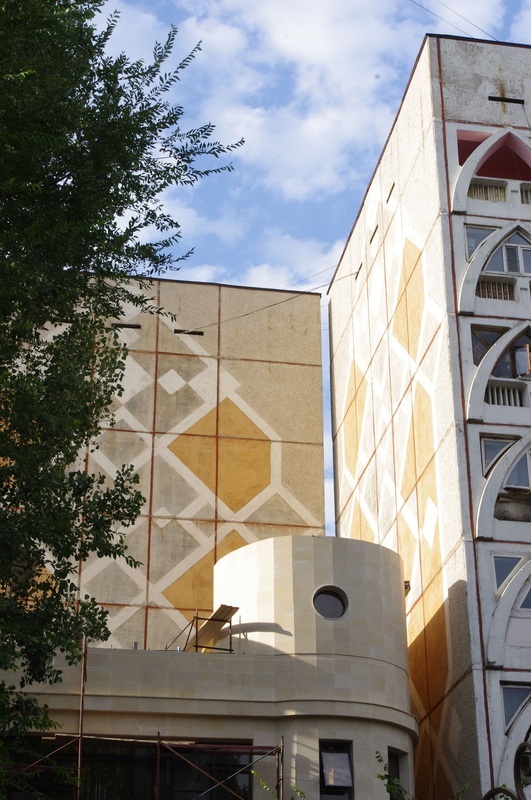 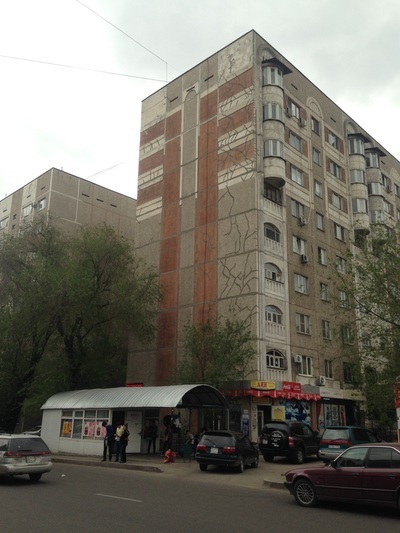 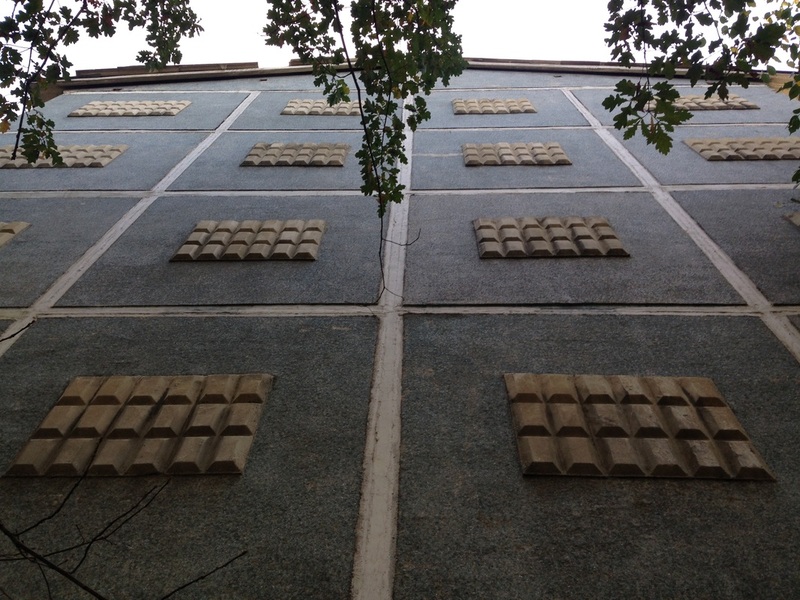 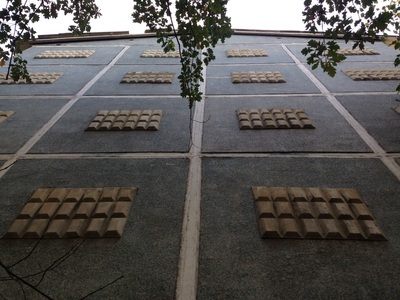 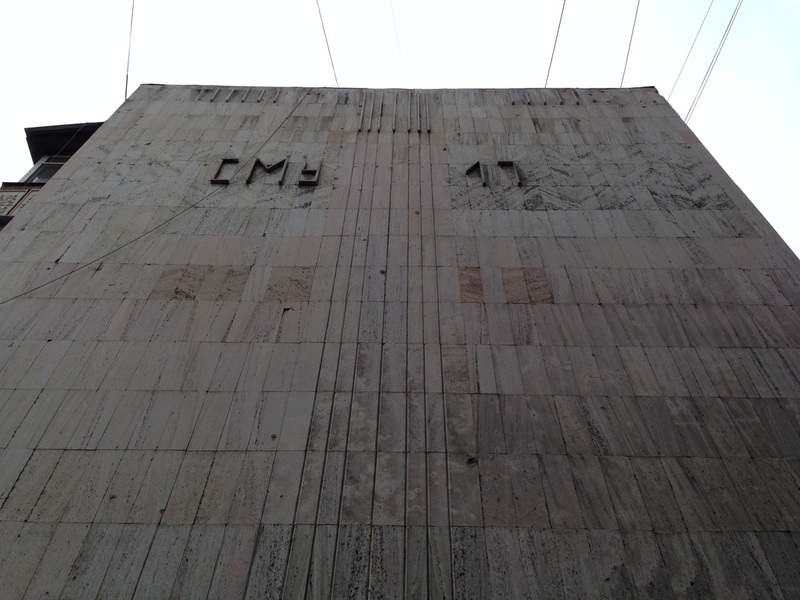 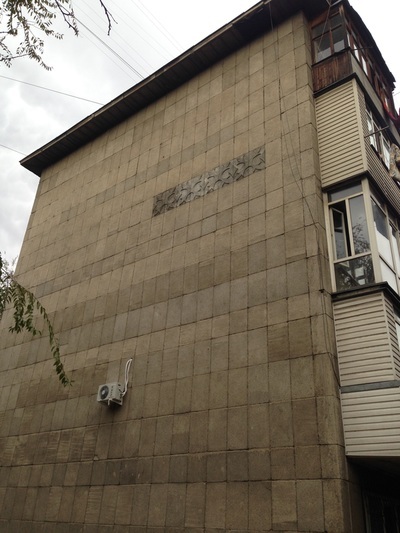 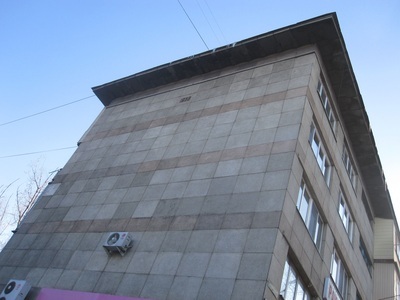 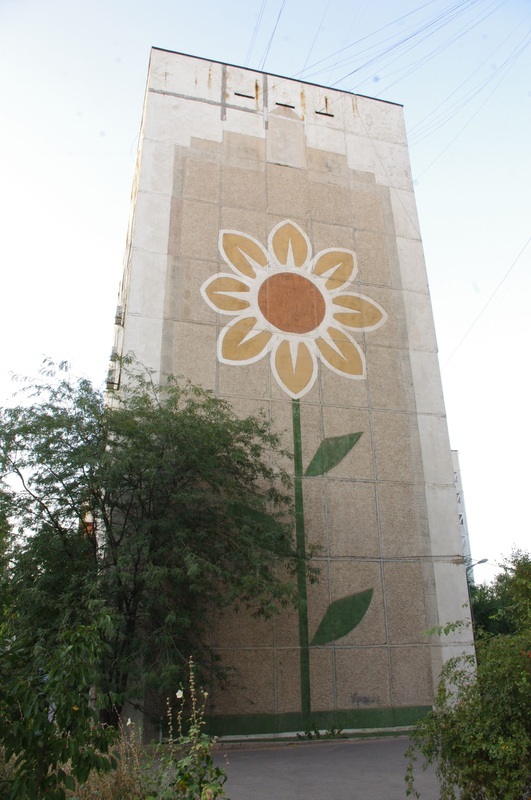 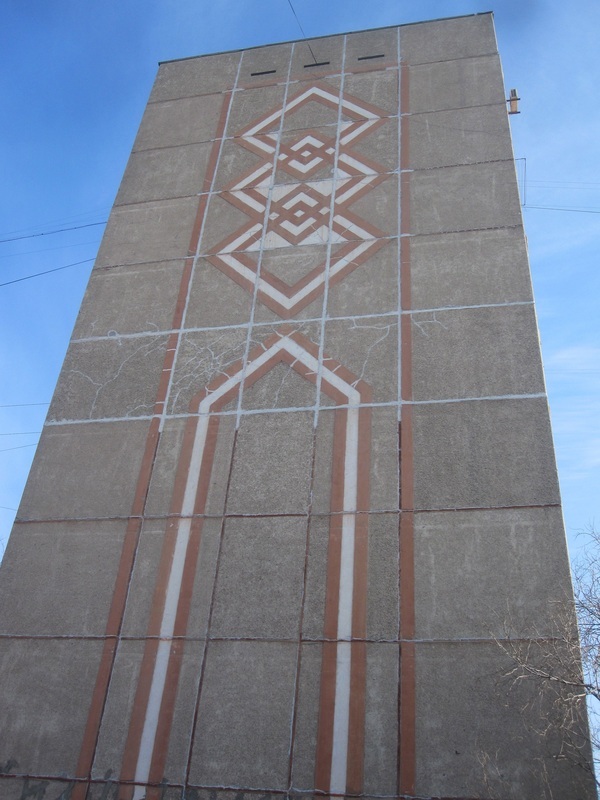 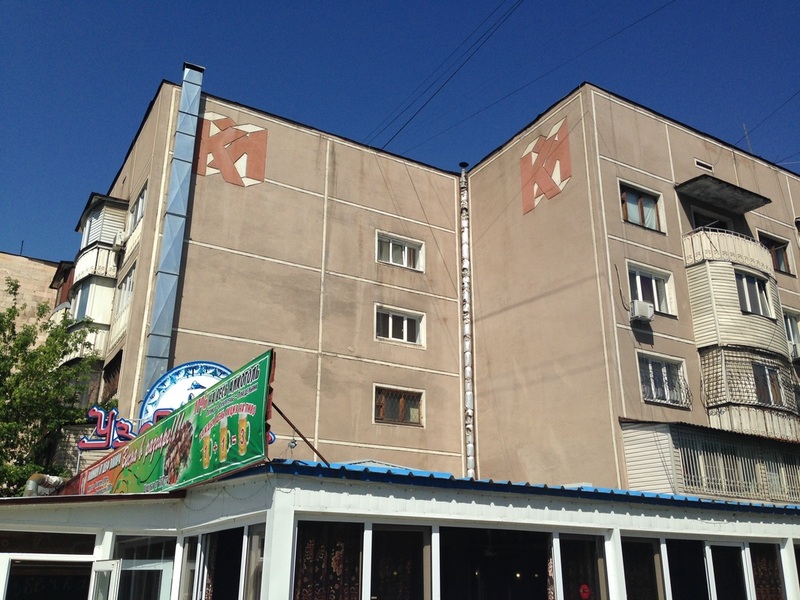 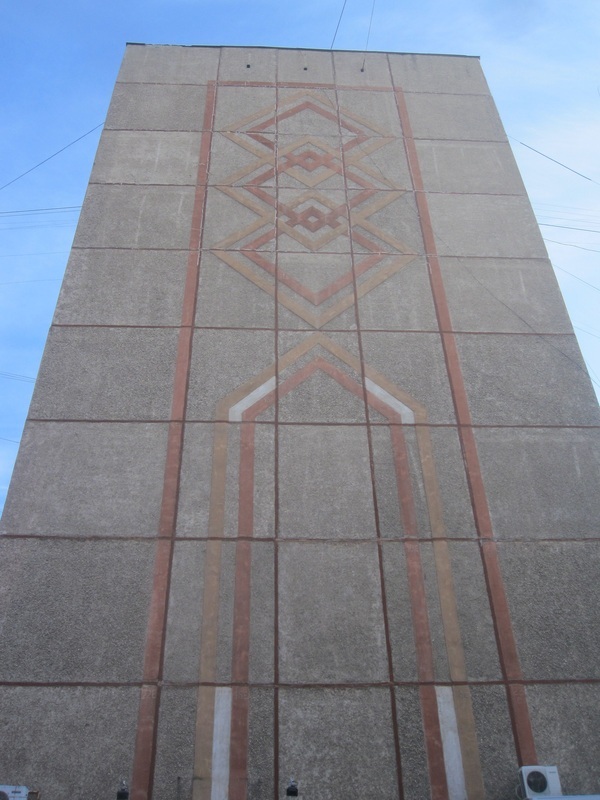 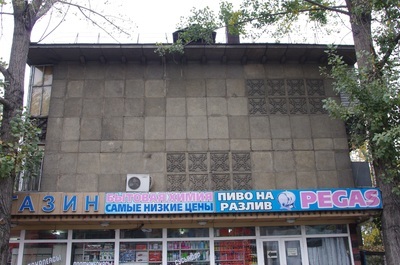 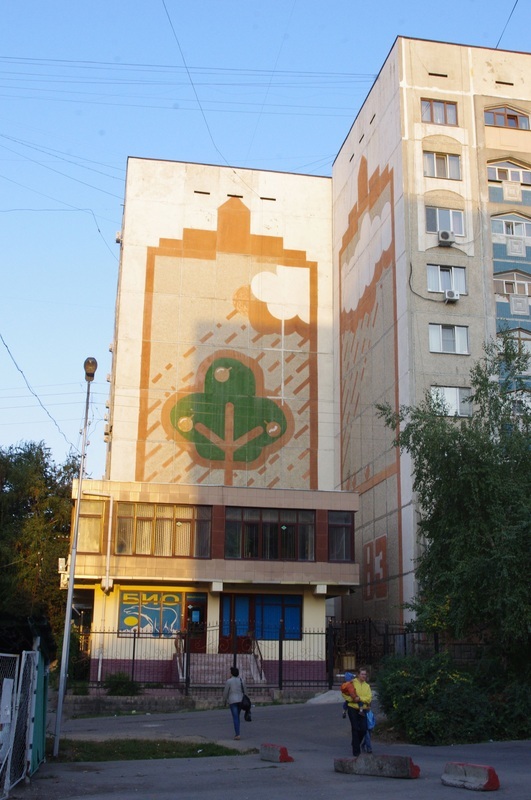 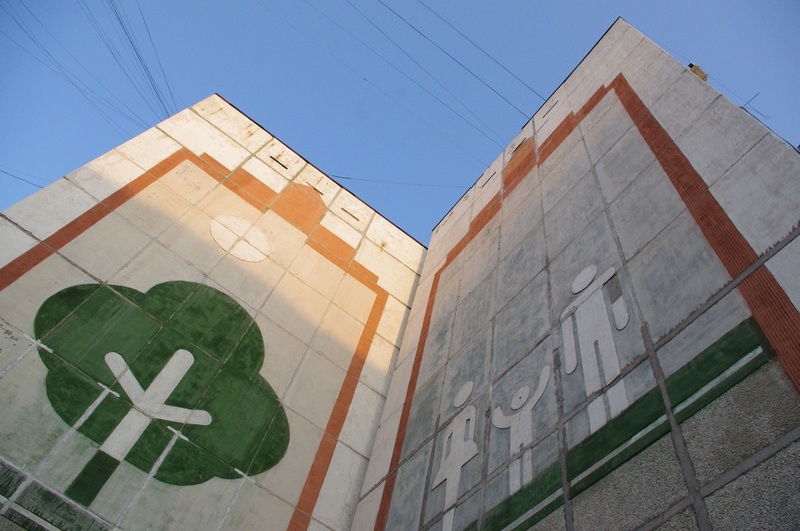 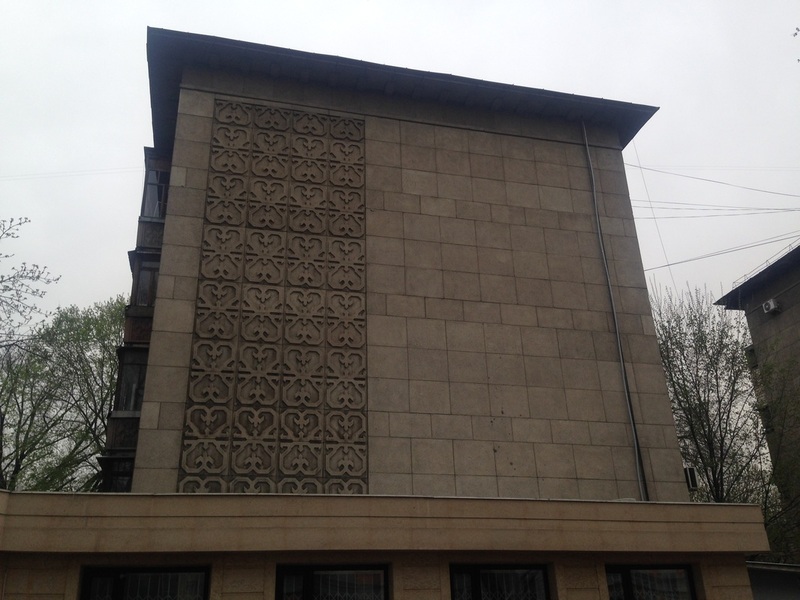 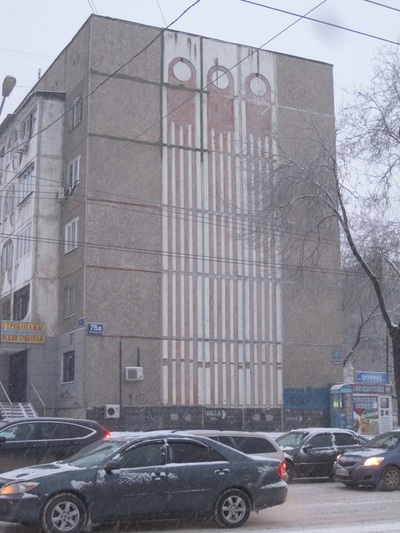 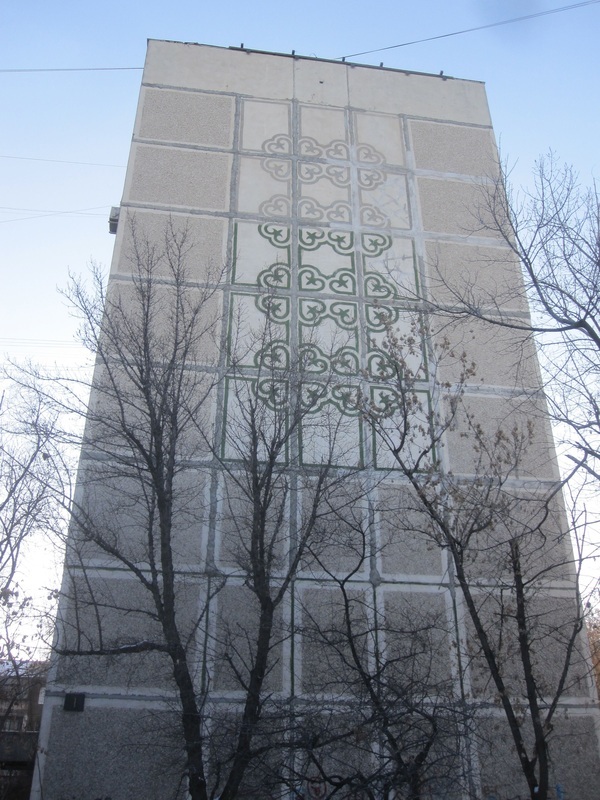 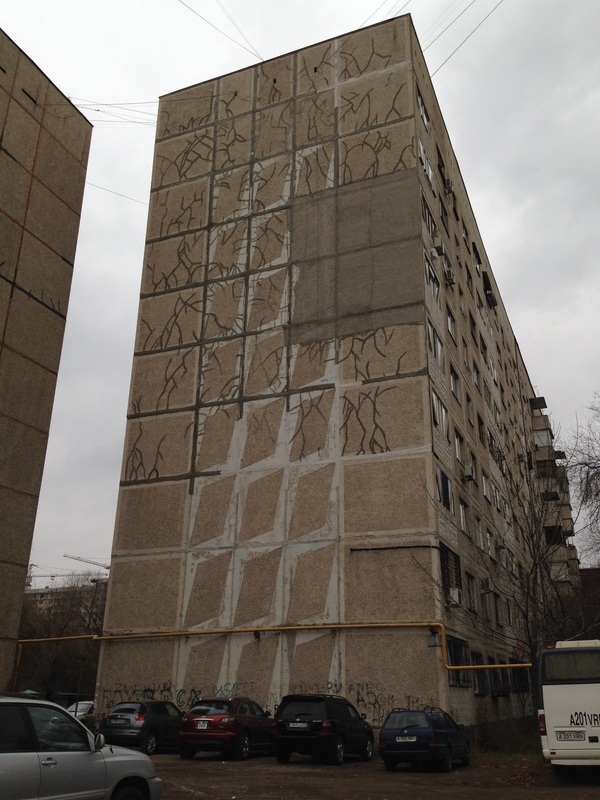 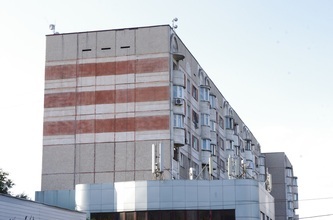 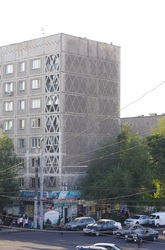 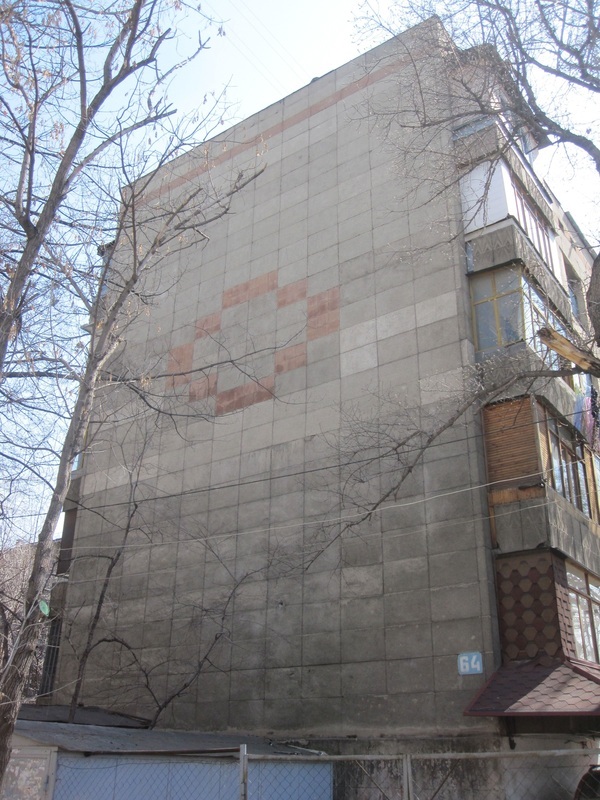 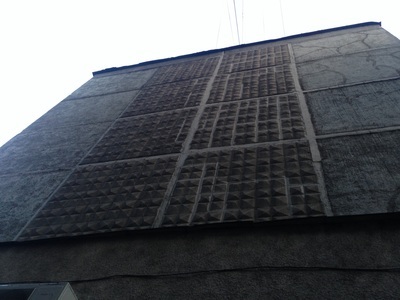 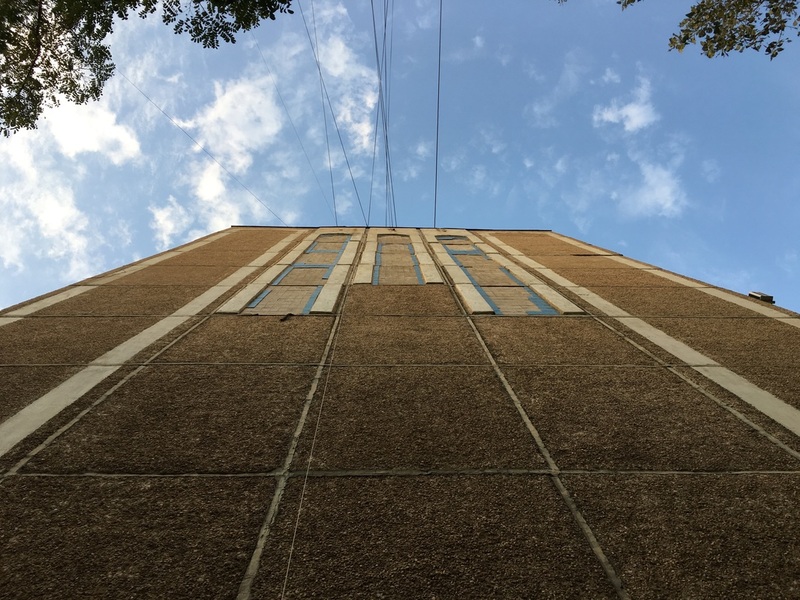 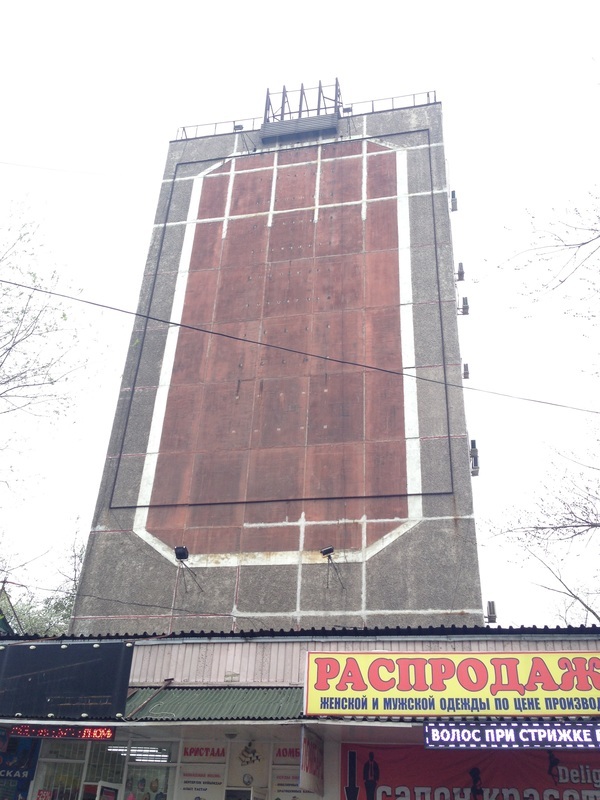 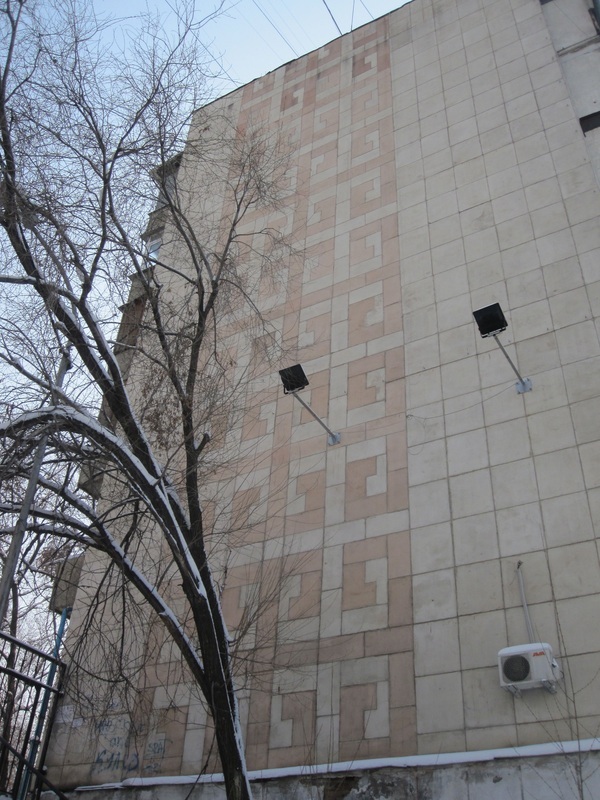 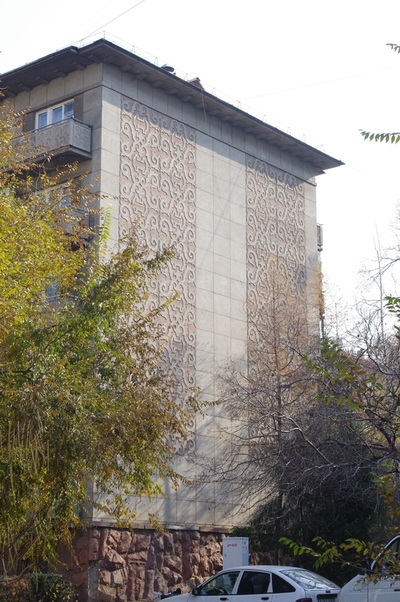 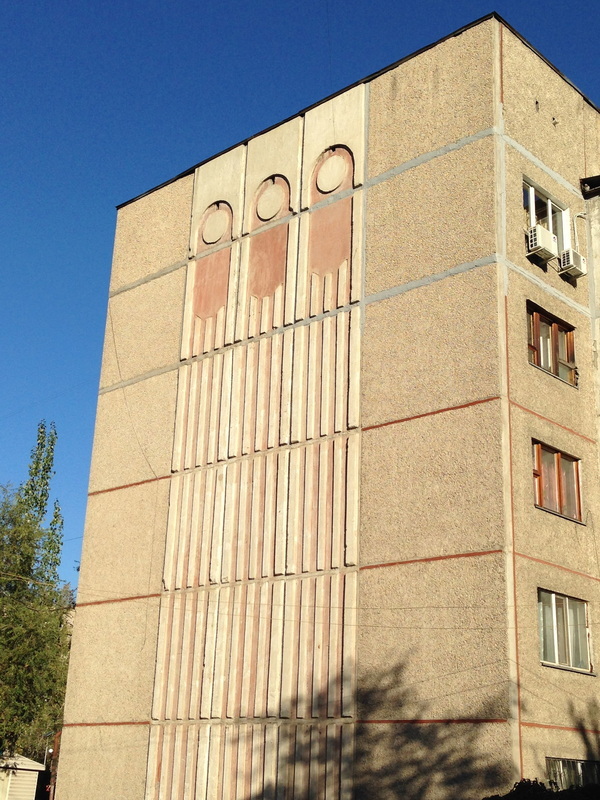 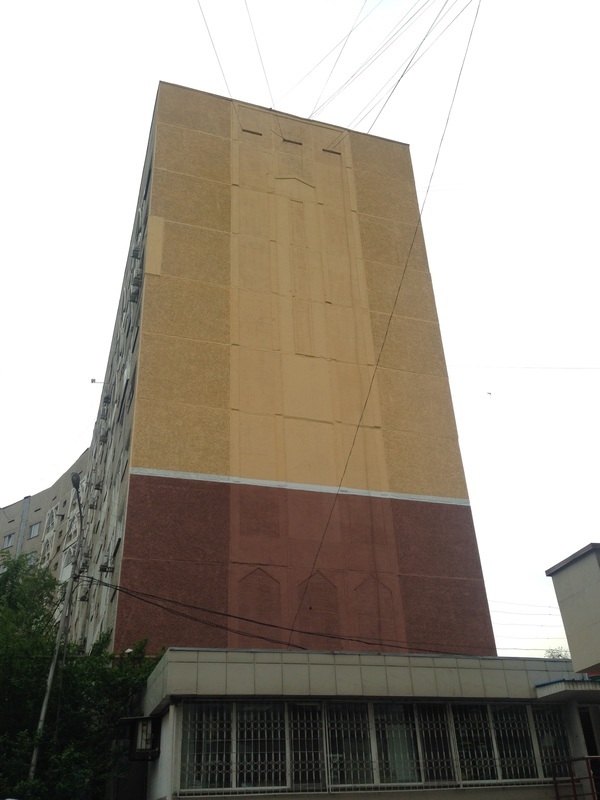 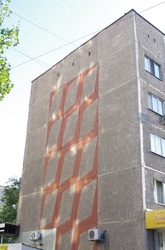 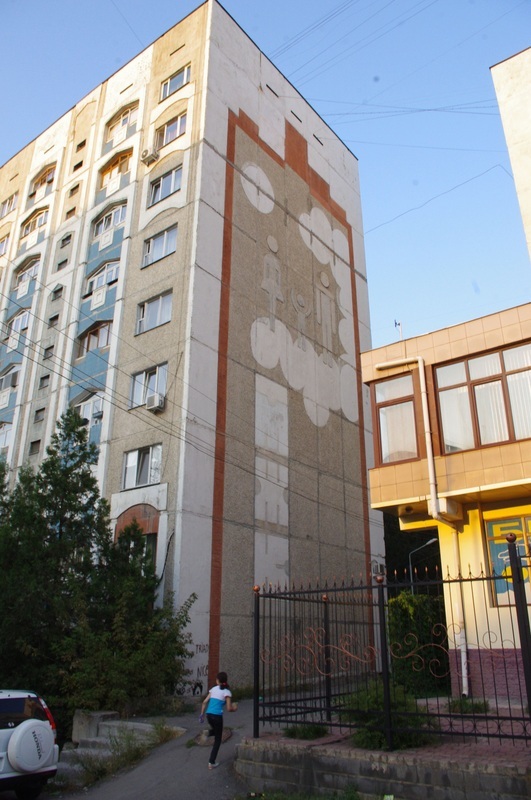 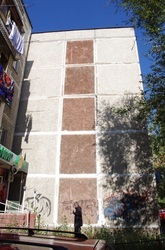 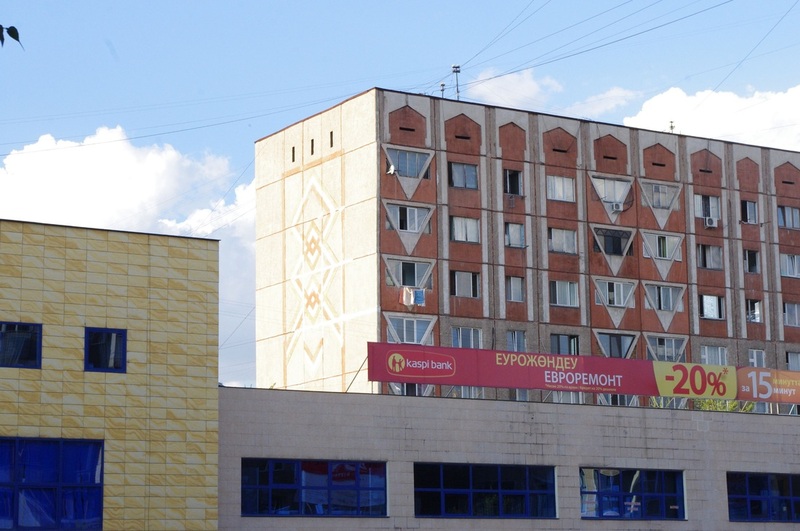 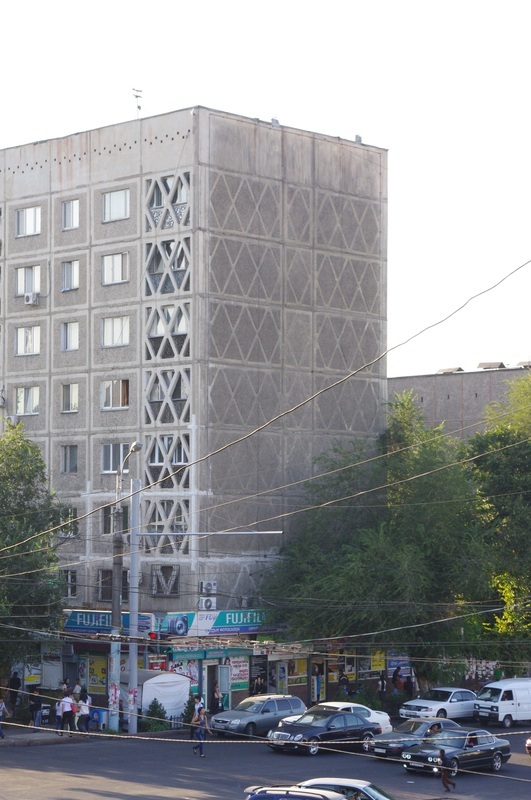 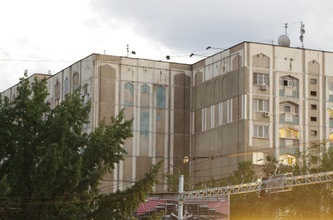 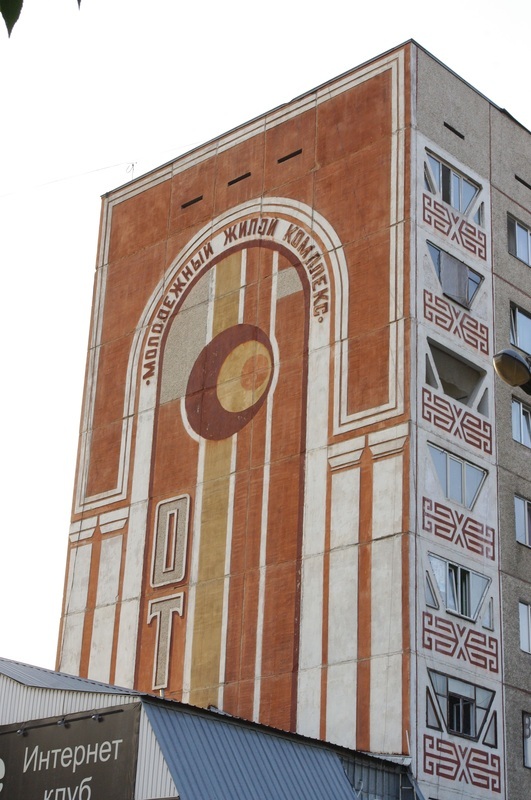 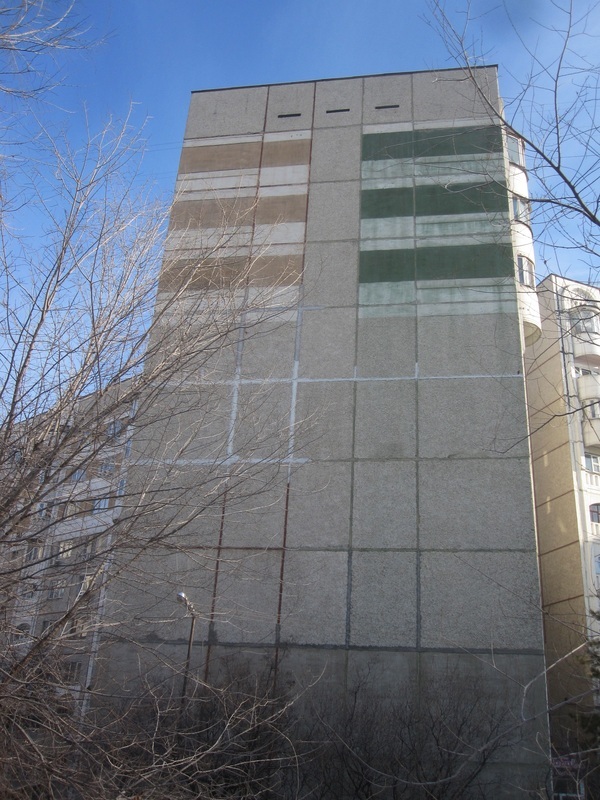 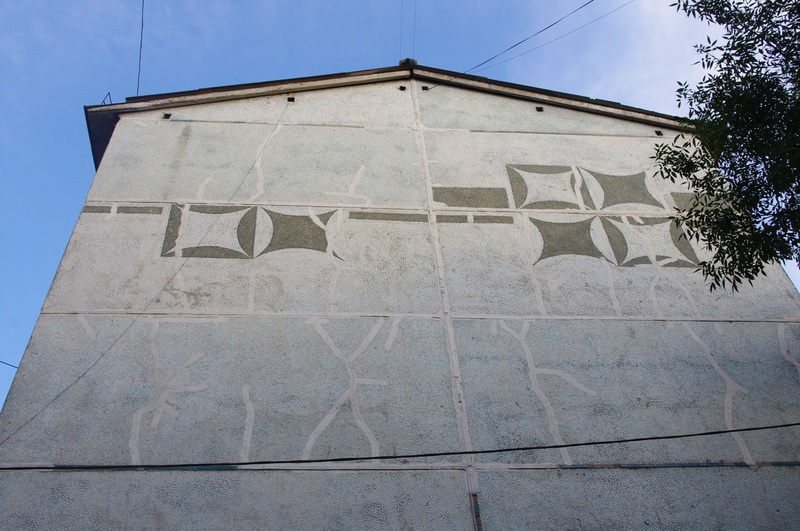 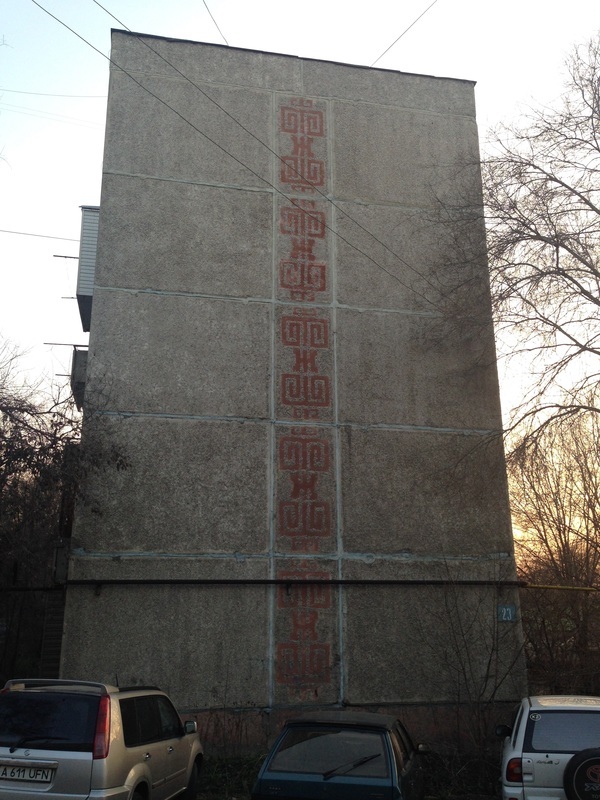 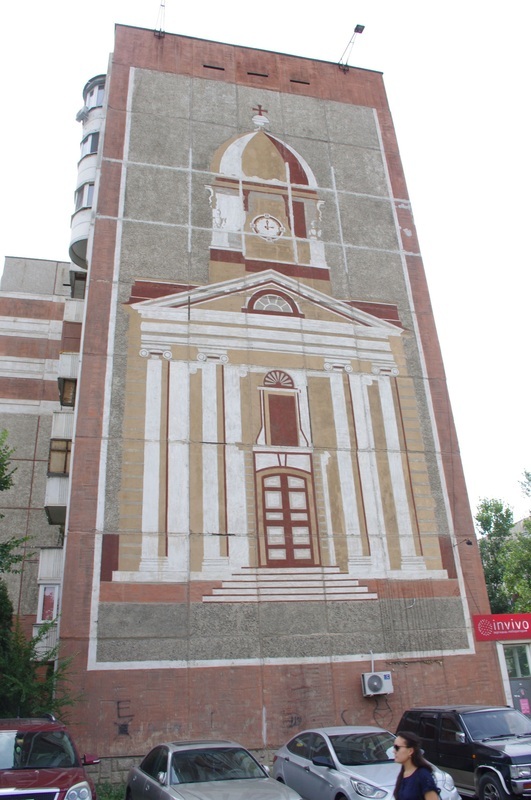 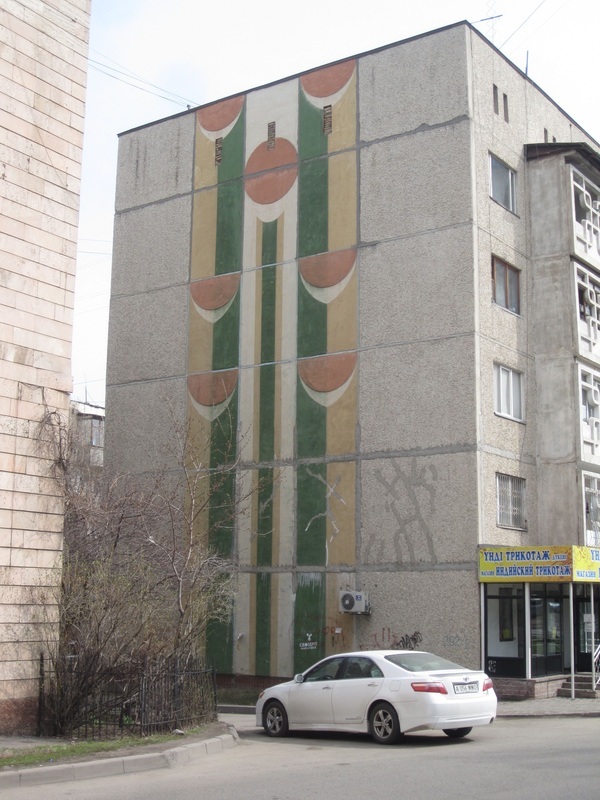 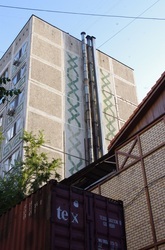 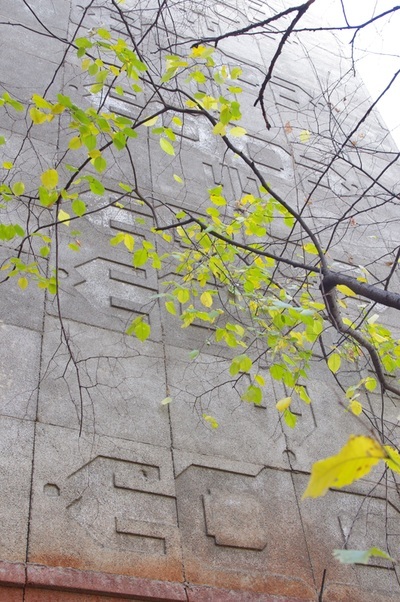 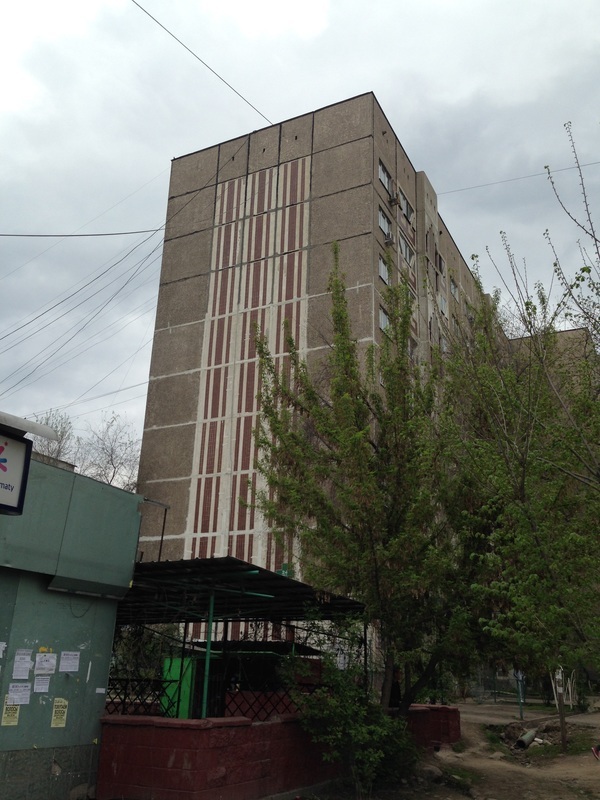 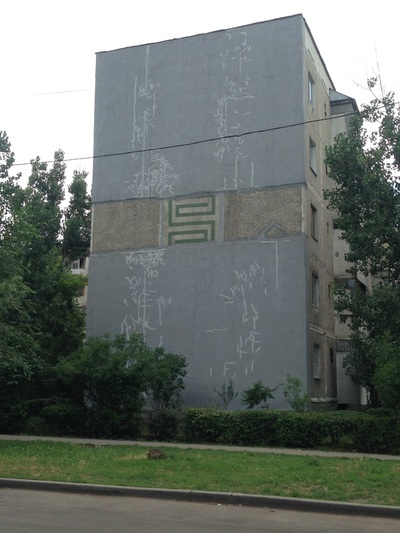 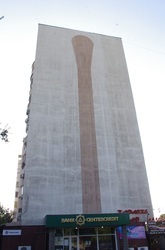 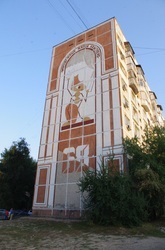 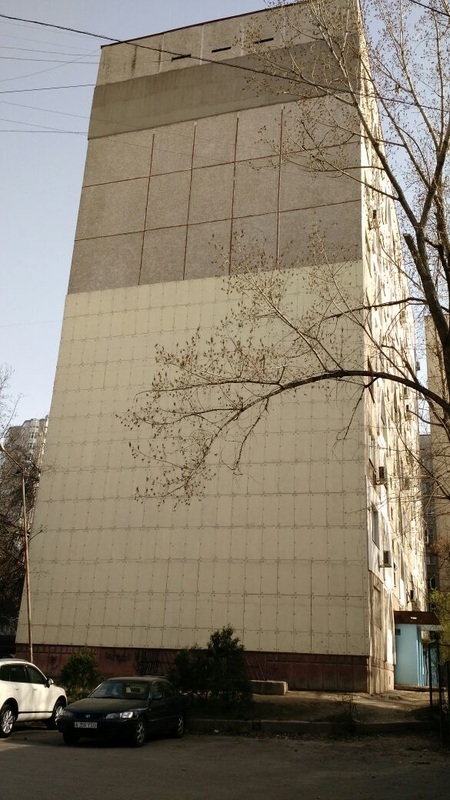 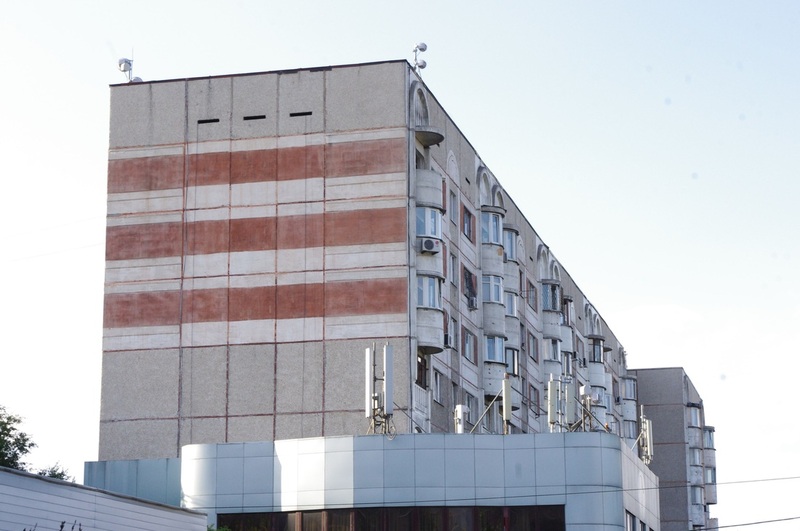 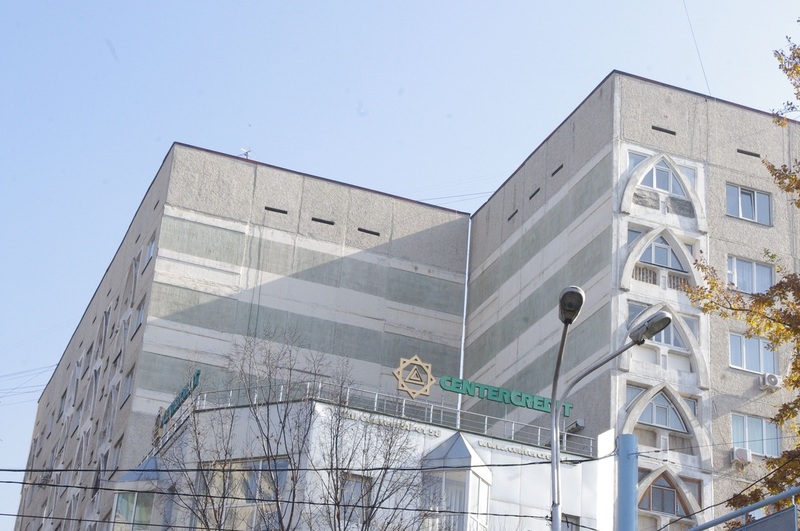 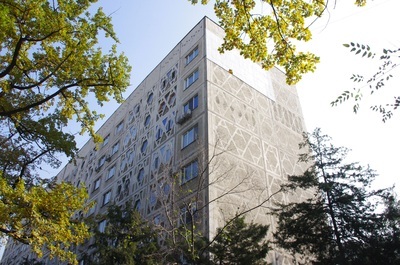 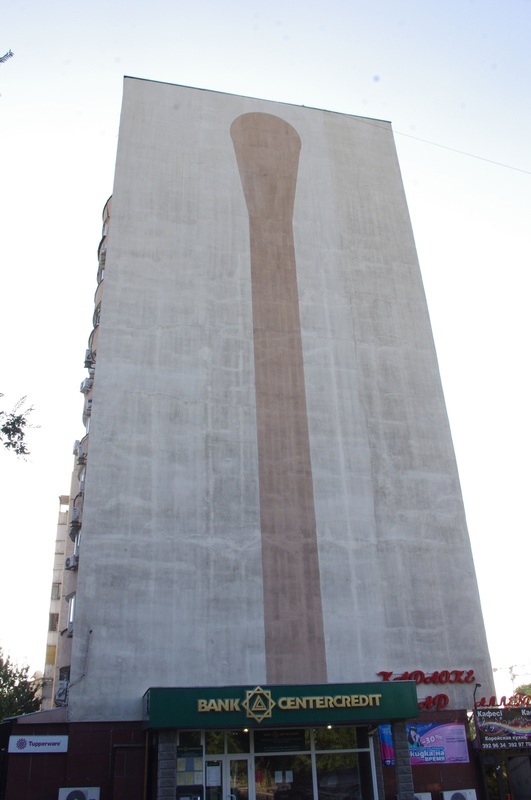 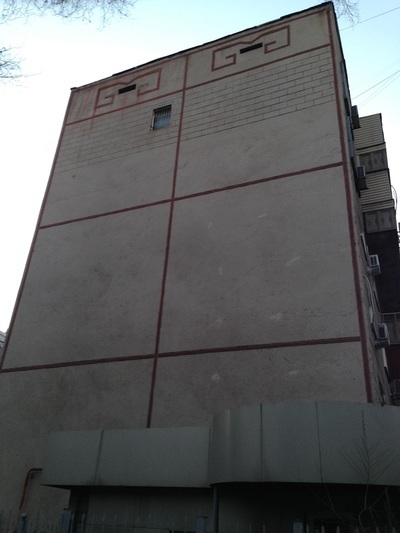 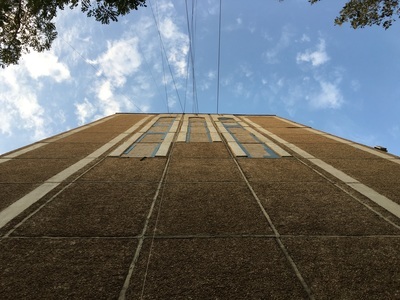 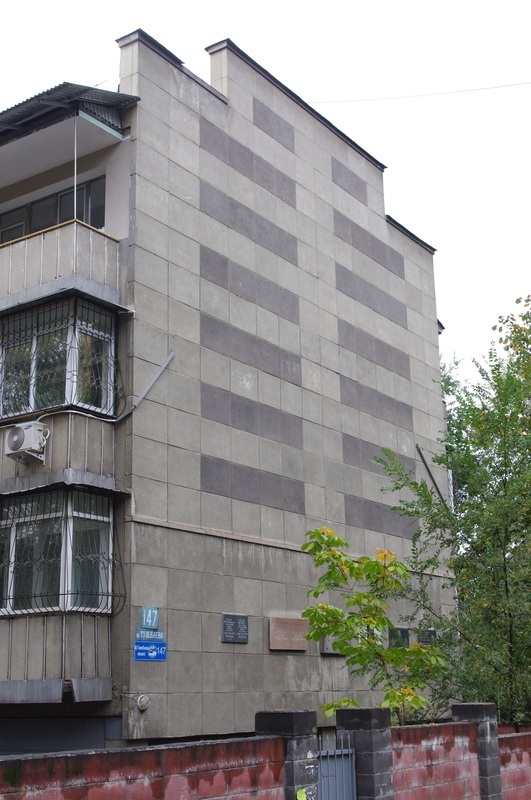 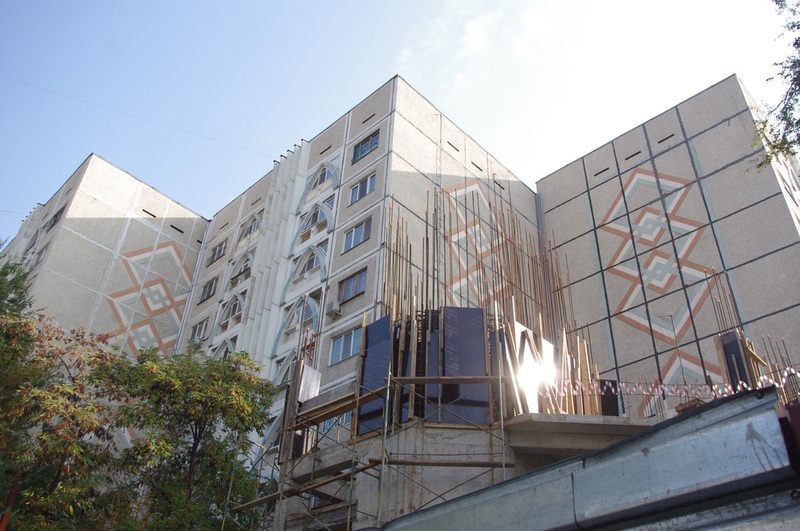 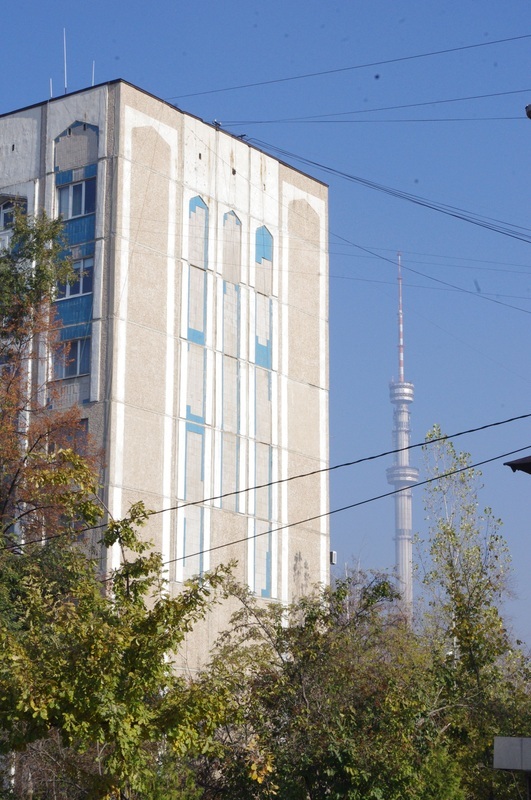 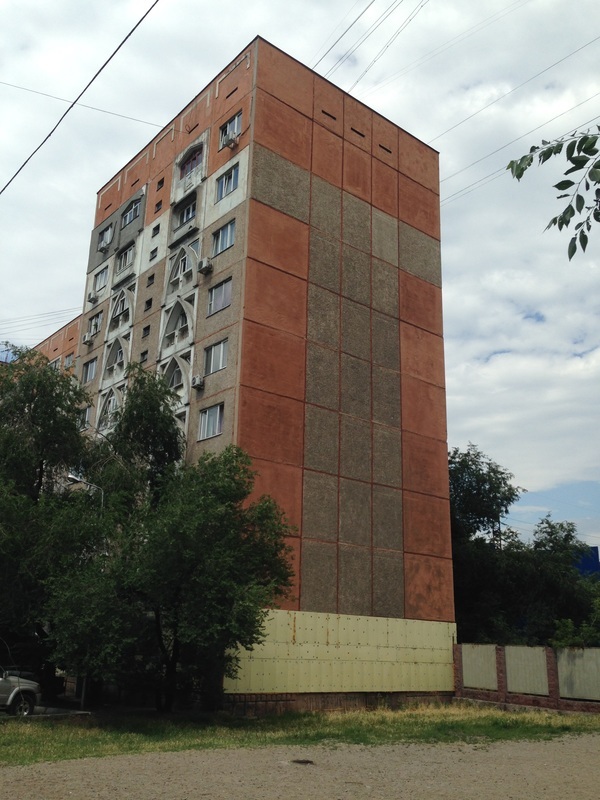 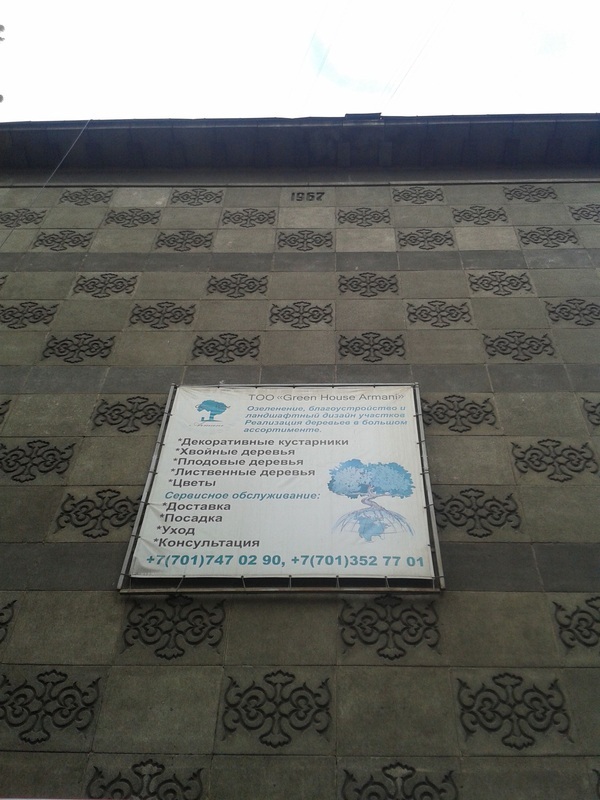 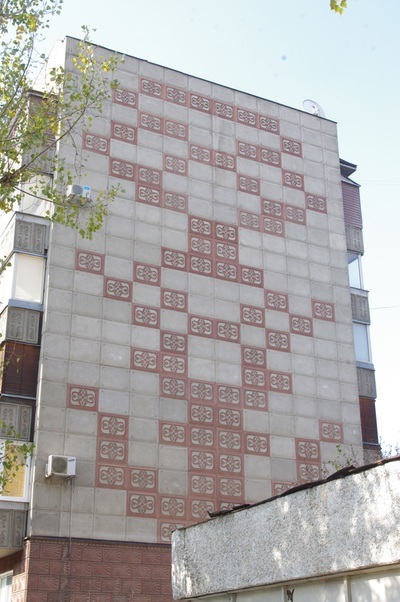 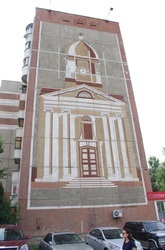 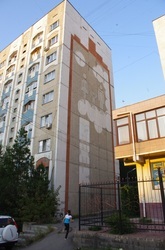 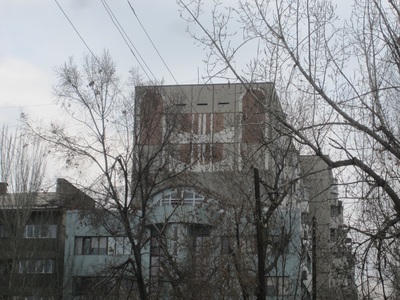 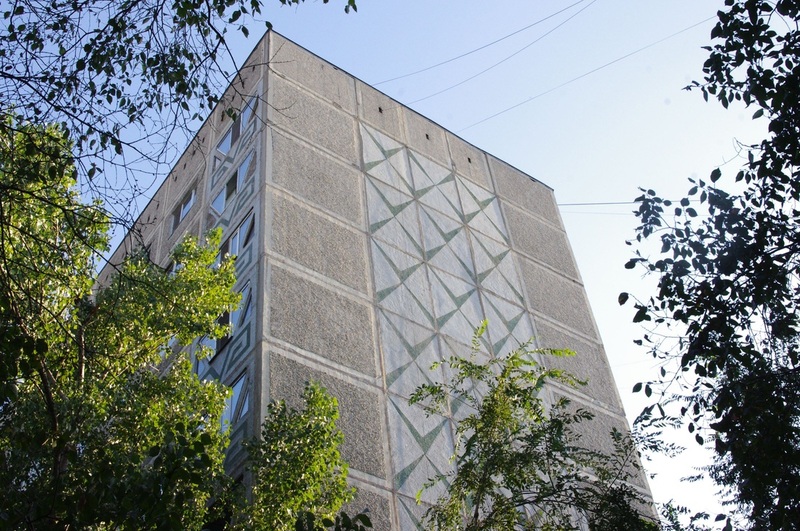 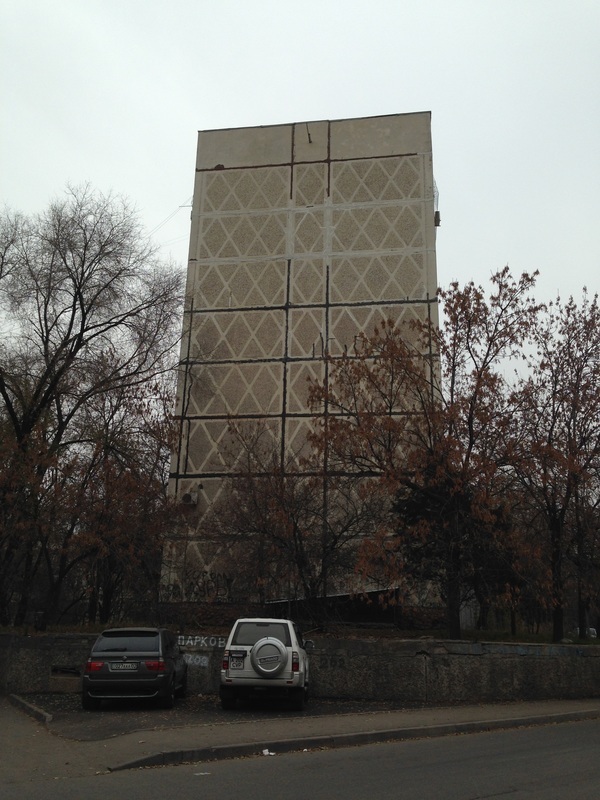 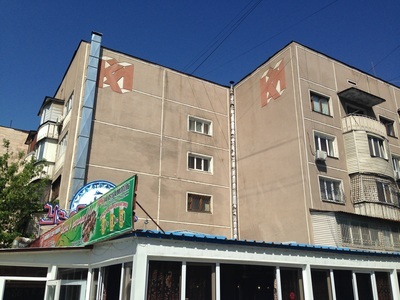 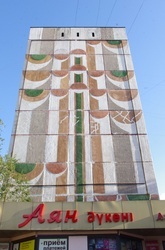 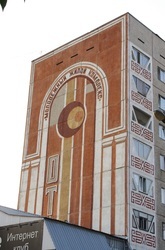 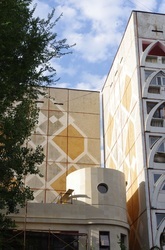 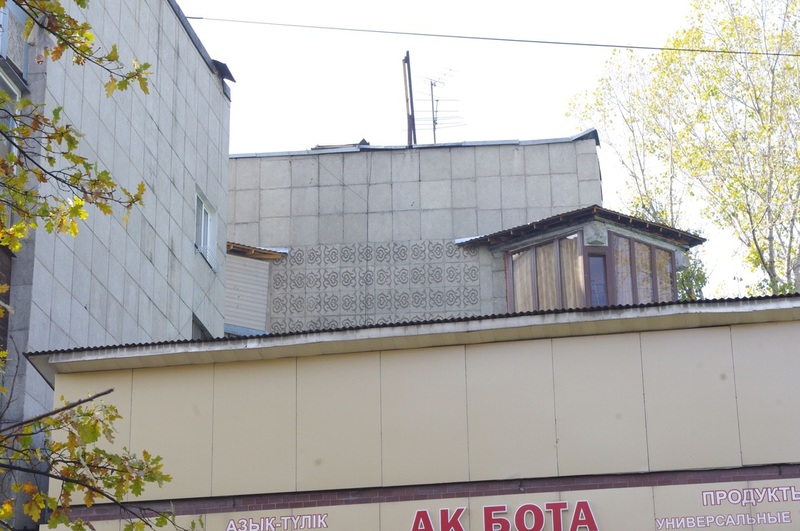 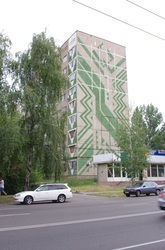 In much of Almaty, one kind of Soviet architecture is unavoidable: panelnoe domostroenye [панельное домостроение], or prefab concrete panel buildings. 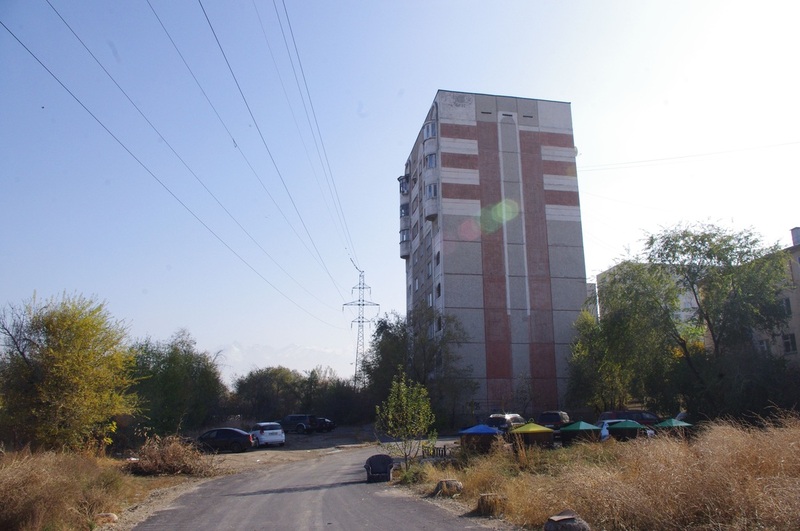 These high-rise buildings were assembled from modular units built in Almaty itself, at the Alma-Ata Building Factory [Алматинский домостроительный комбинат; Almatinskiy domostroitelny kombinat]. 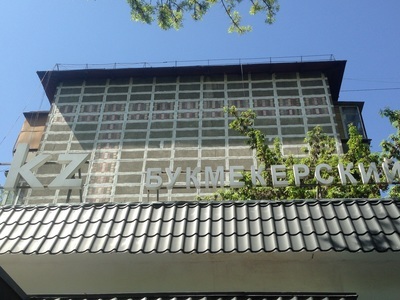 This factory was known by its Russian initials ADK, and in its place there now stands a shopping mall with the same name. 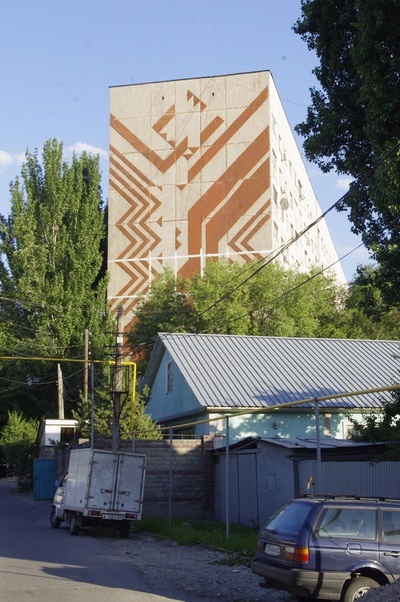 Back in its prime, the complex churned out cement panels at an astounding rate, transforming Almaty into a post-war boomtown. Khruschev-era architecture aimed for efficiency above all, so the very same building plans were used at dozens of sites across the city, and the buildings themselves were minimalist, little more than apartments shaped like trailers, stacked to the sky. 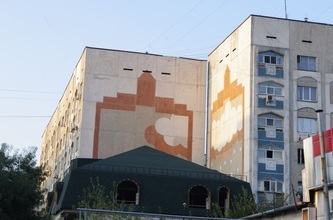 One of these models, the E-162 (Э-162), is especially prevalent, and it's recognizable by the radically-decorated walls on the ends of the buildings. 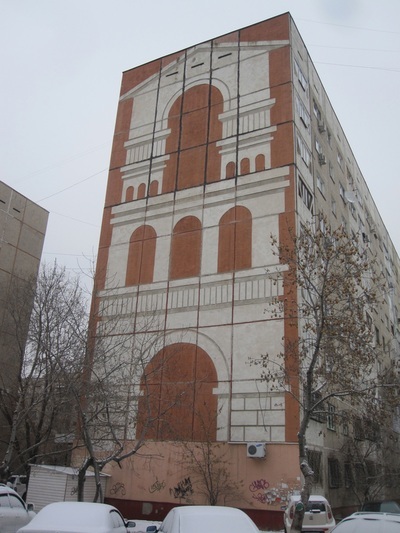 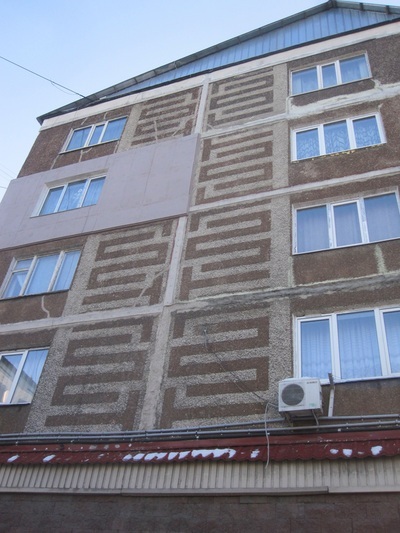 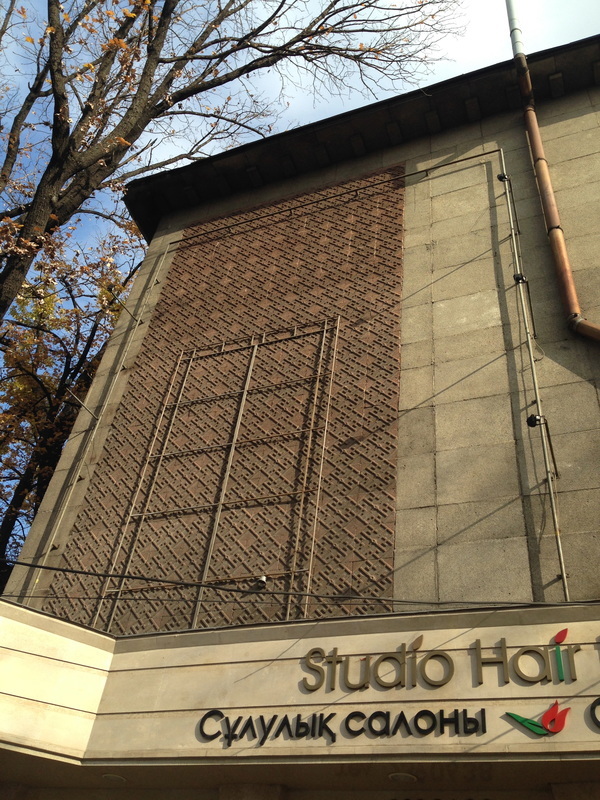 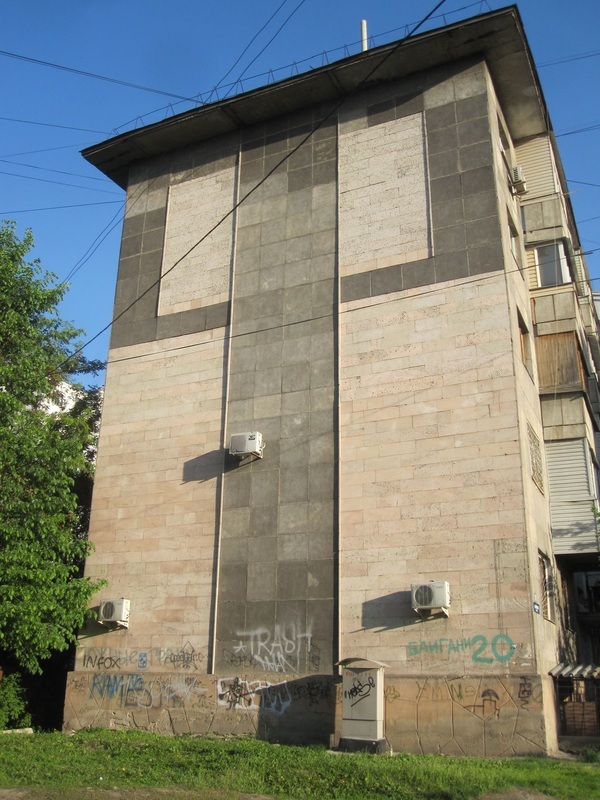 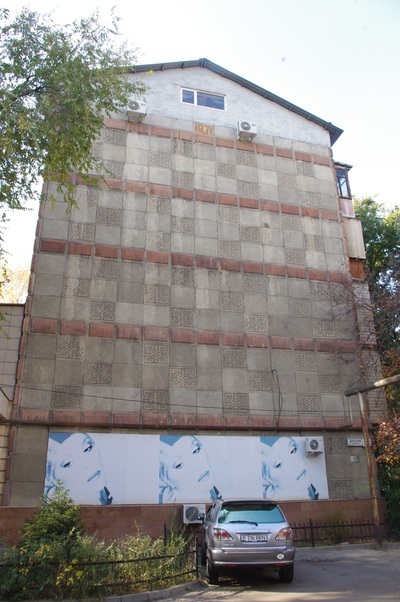 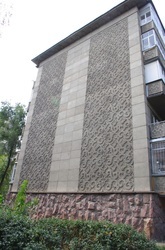 These windowless walls, in Russian called glukhie steny [глухие стены; "deaf walls"] or the German-derived brandmauer [брандмауэр], were a necessary consequence of modular construction - on the inside, there of course weren't windows looking from one apartment module into another, so the apartments on the end of the buildings didn't have windows along their length, either. 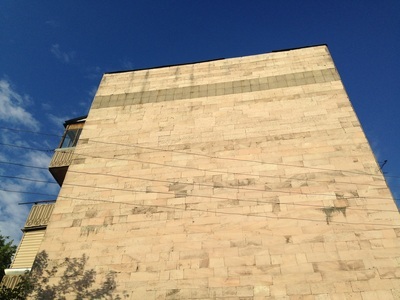 Often, these outer walls were left entirely blank, just a massive facade of concrete with the seams still visible between units. 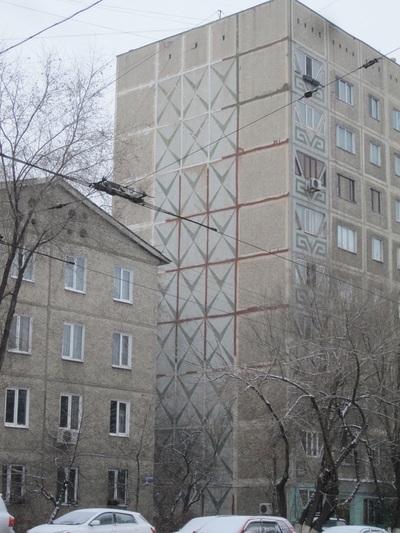 Other times, to the urban explorer's delight, these building ends were decorated with multicolored geometrical patterns or giant murals, giving each clone-like building a sense of character. 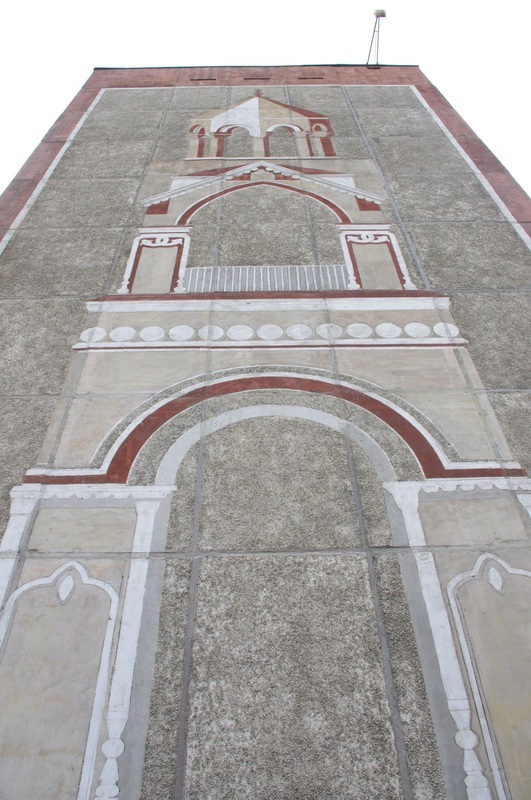 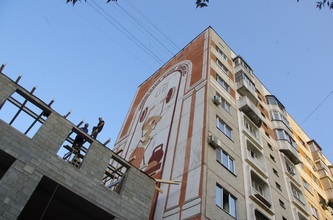 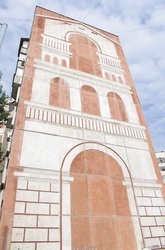 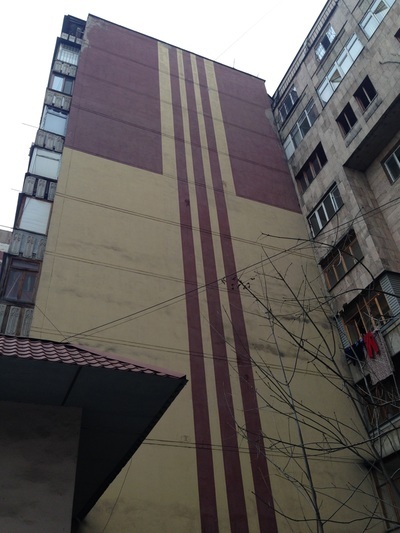 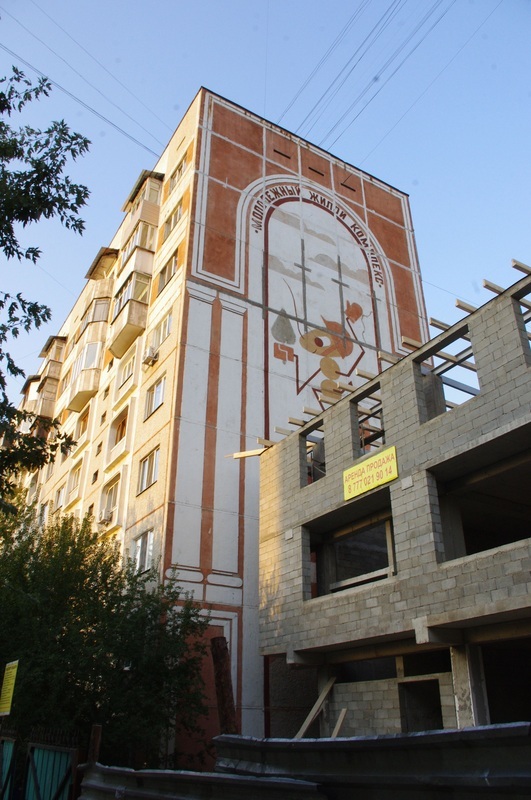 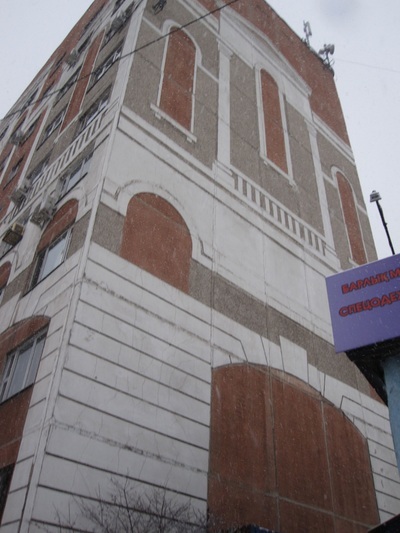 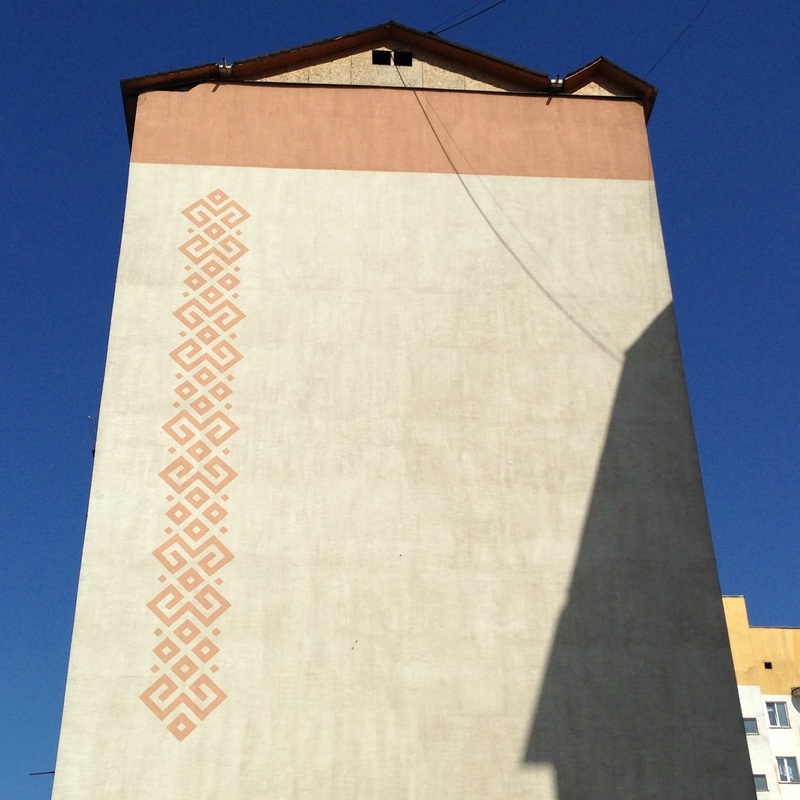 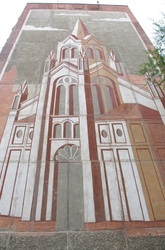 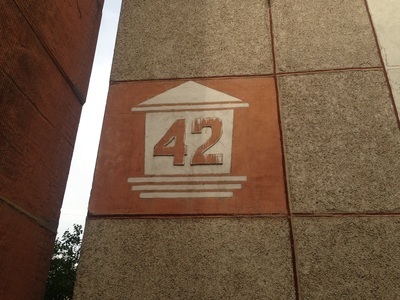 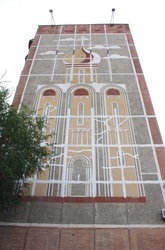 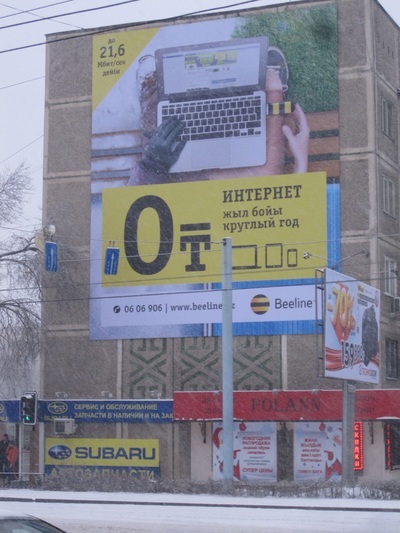 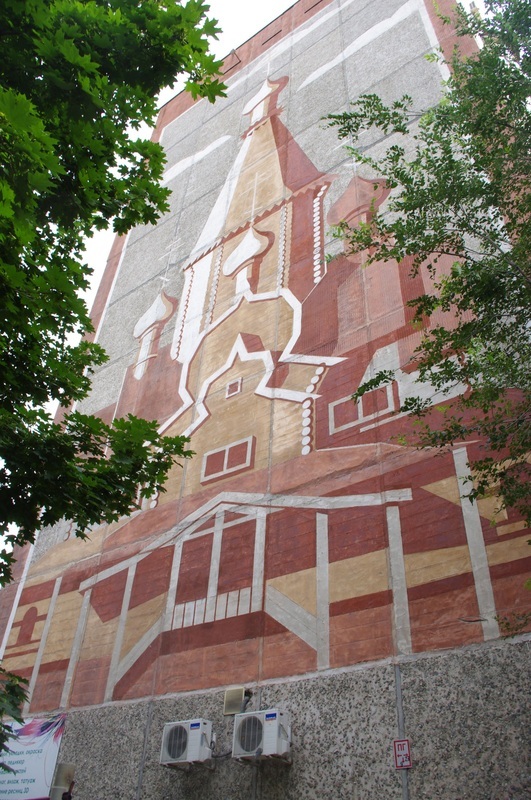 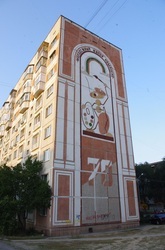 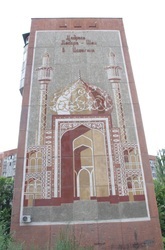 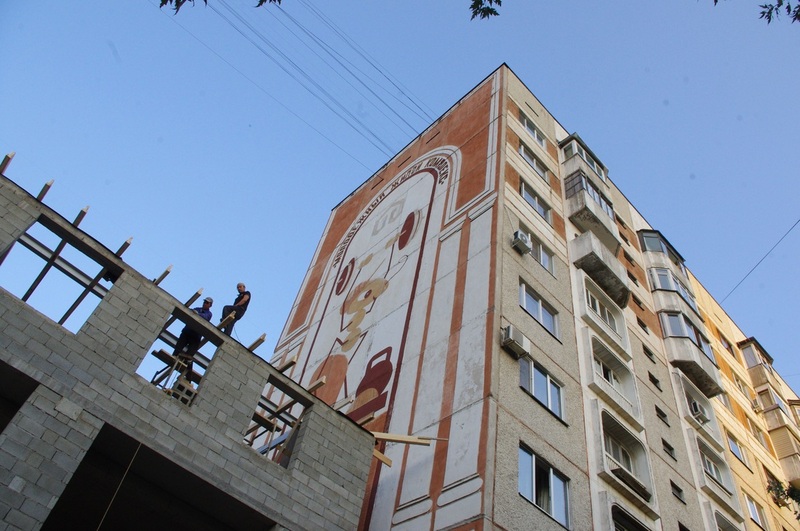 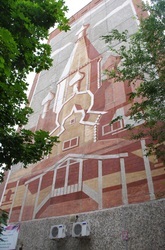 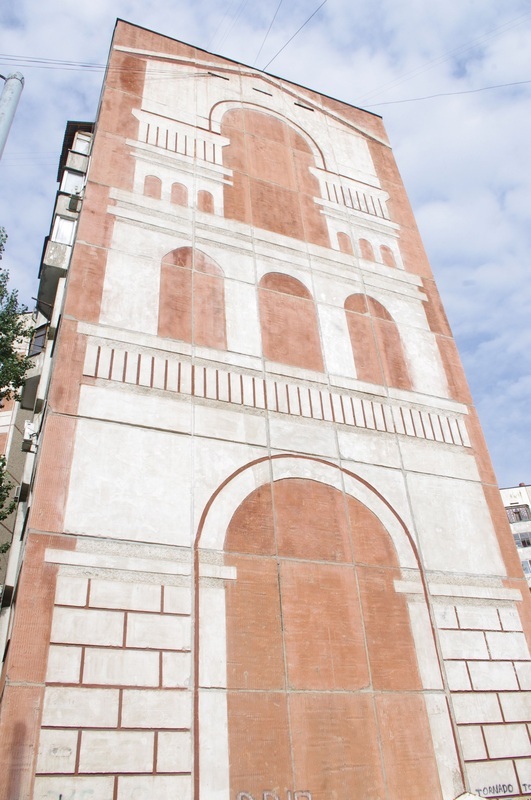 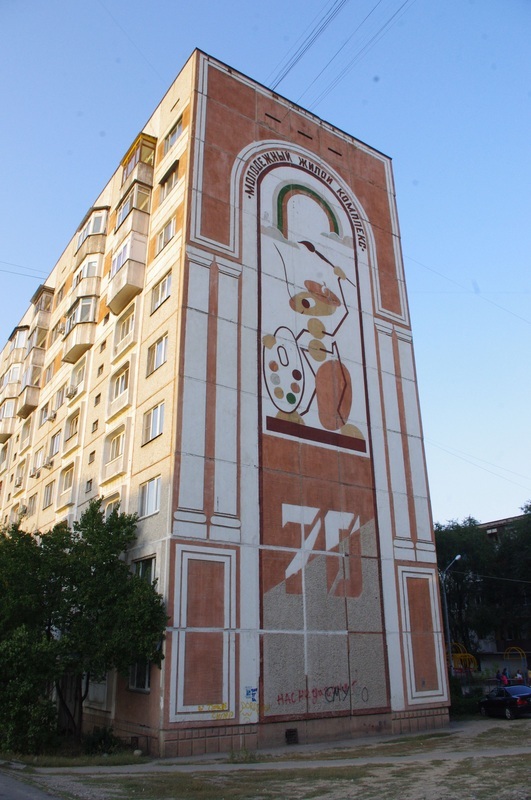 The most iconic and impressive brandmauers in Almaty must be the walls facing Saina Street in the Zhetisu-2 Microdistrict. 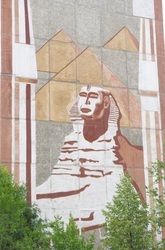 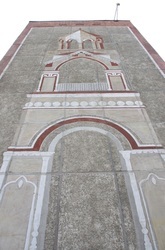 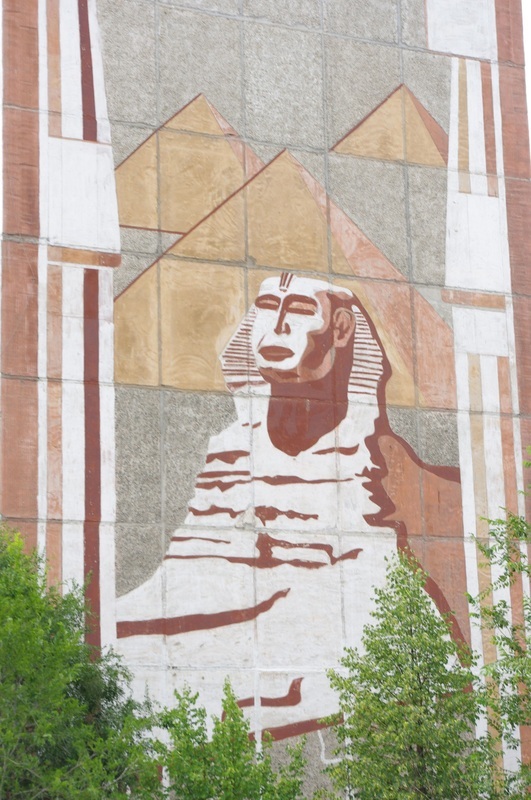 Driving along the wide avenue, visitors are stunned to see the Giant Sphynx painted on the side of a giant prefab highrise; farther down the street are the Parthenon and the Taj Mahal. 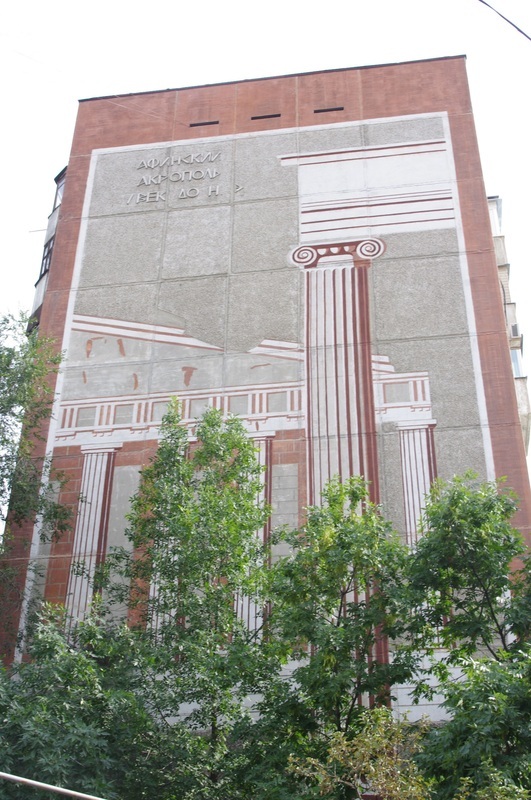 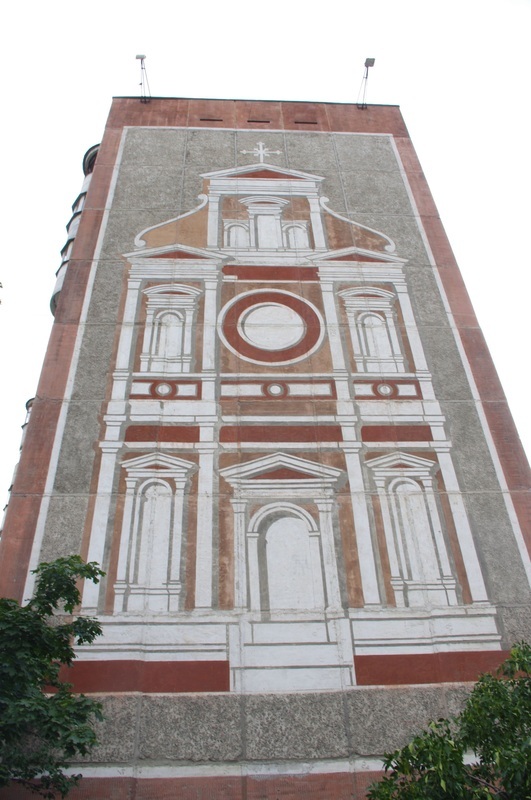 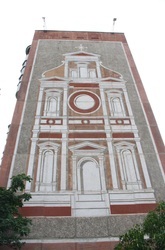 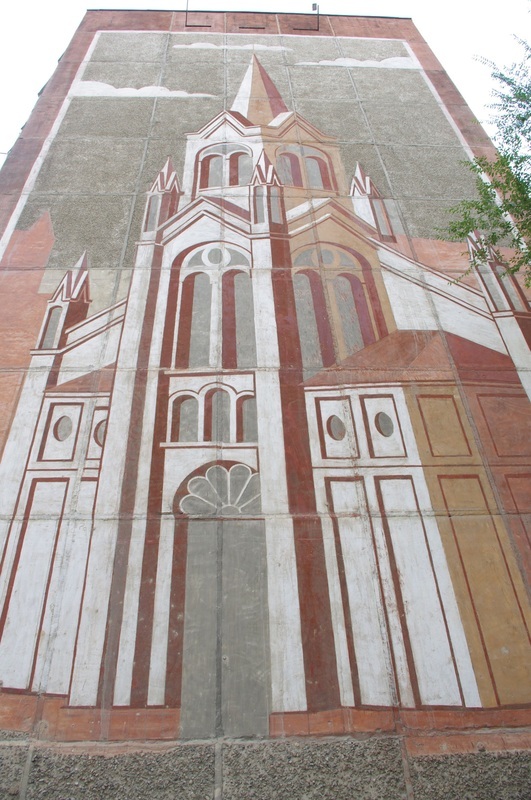 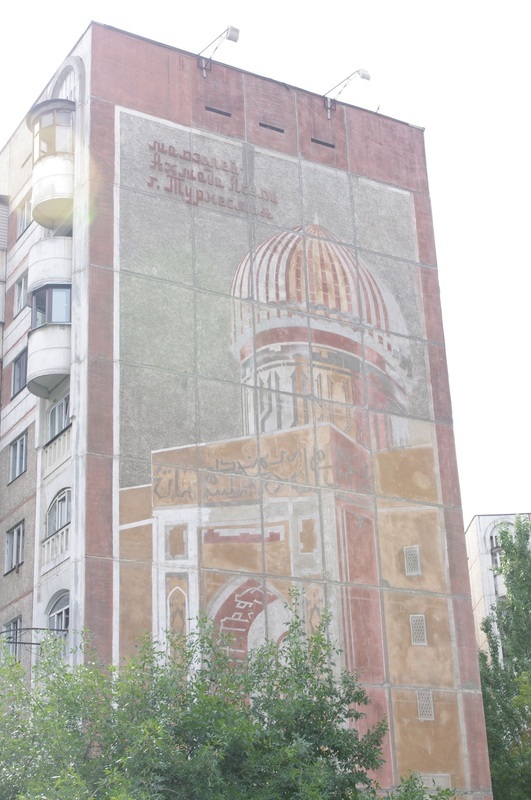 Whoever ordered this series of murals certainly has a strange sense of humor, as the parade of painted landmarks only reminds you that the buildings they're found on are as uninspirational as the Sphynx is grand. . In another microdistrict, Taigul-2, the brandmauers feature a series of anthropomorphized ants, one with a painter's palette, one giving a theatrical monologue, and another with a mason's trowel. 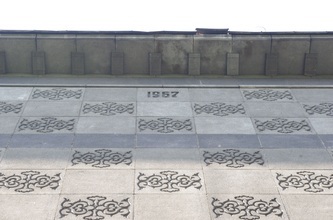 The years of completion ('68, '70. and thereabouts) are printed in big type too, along with three words that give a clue to the buildings' provenance: molodyozhny zhiloy kompleks [молодёжный жилой комплекс], or Youth Residential Complex. 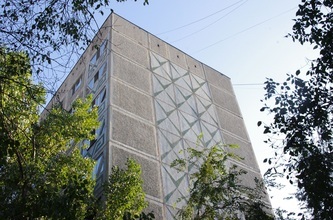 Known by its initials as an MZhK, this kind of housing project was built for young families and organized by cooperatives of the families themselves. 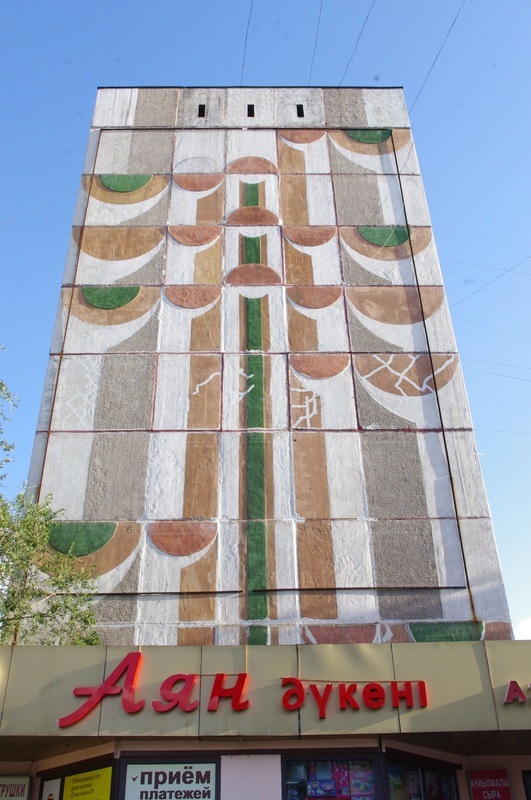 The ant here represents the builders, adept at construction (hence the trowel) but also at the high Soviet arts too, ever the well-cultivated proletariat. 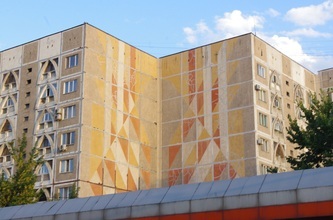 In other parts of the city, especially along main arteries like Tole Bi, Satpaev, and Momyshuly, 9-story pre-fabricated apartment blocks feature geometrical designs in red, green, yellow and blue. The E-162 model doesn't get to have all the fun, though. 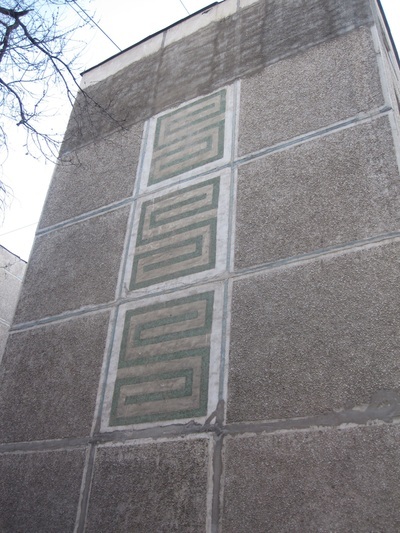 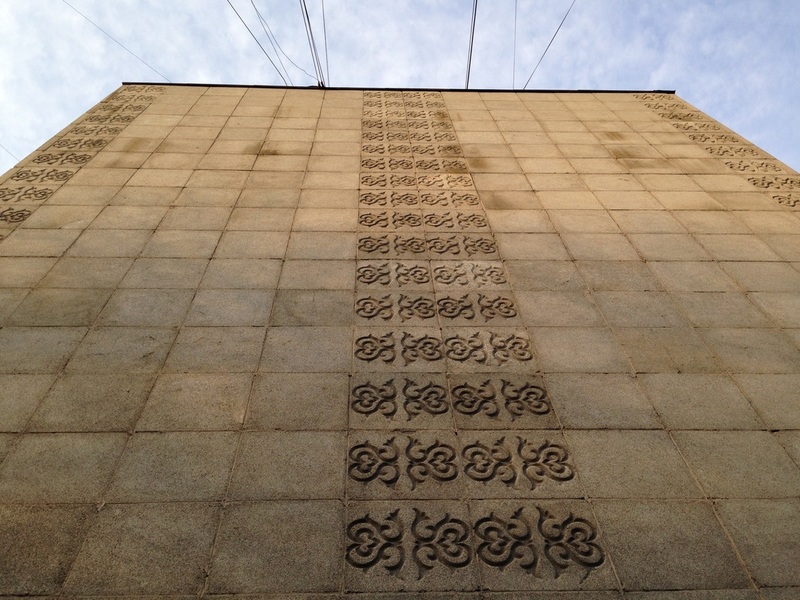 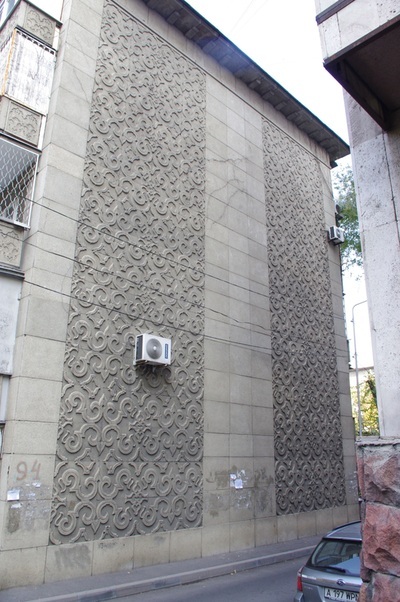 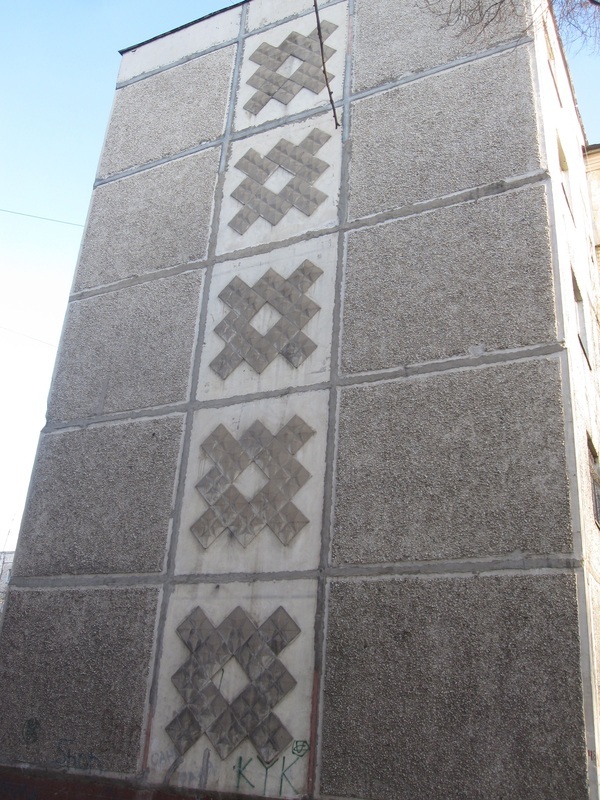 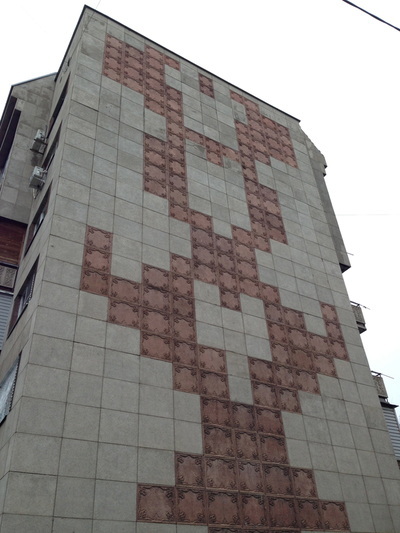 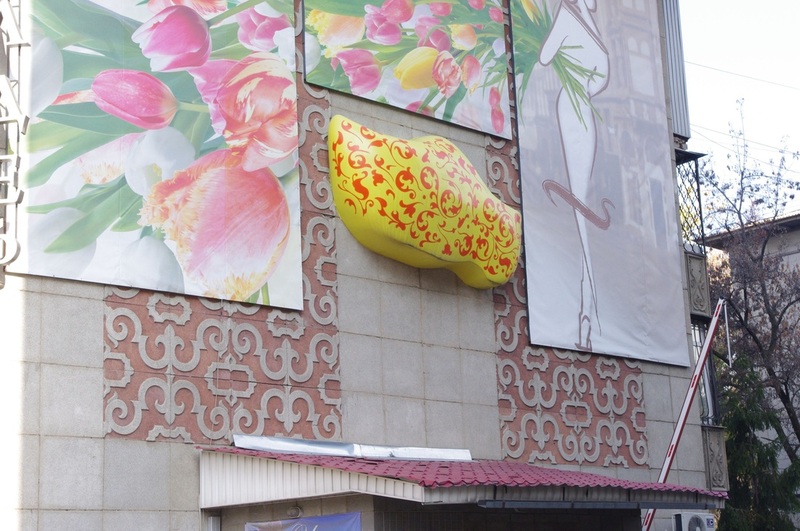 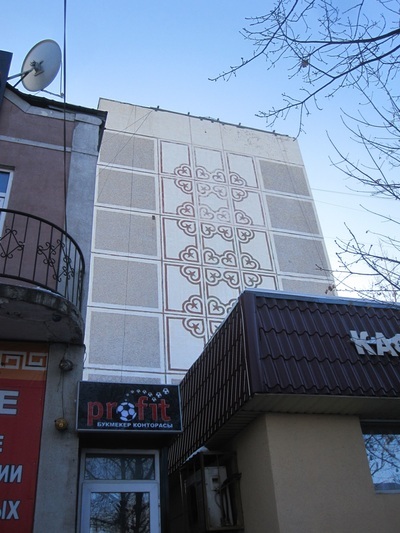 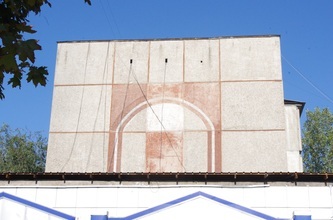 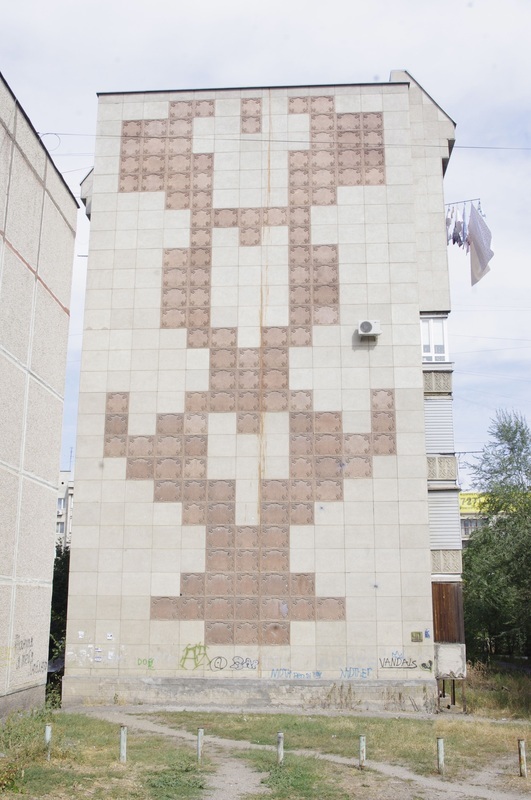 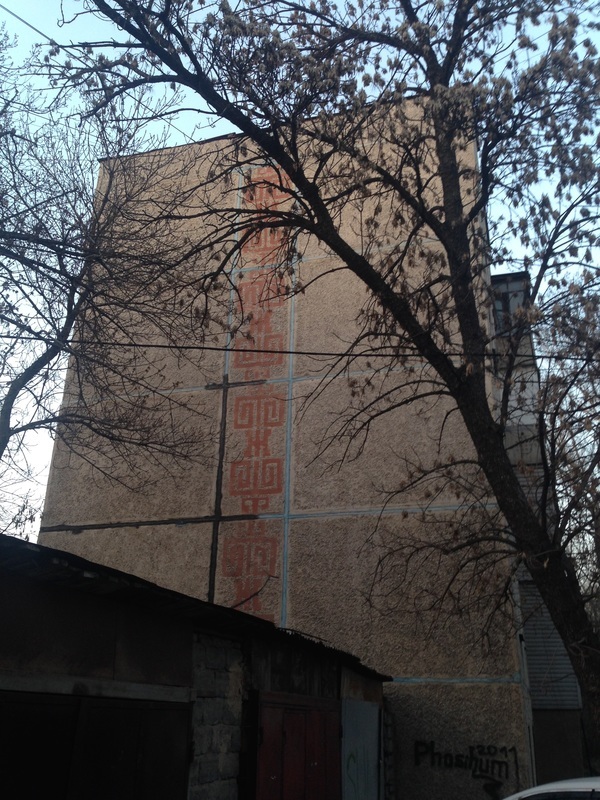 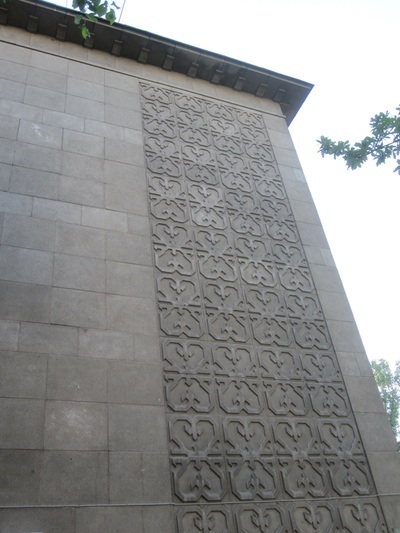 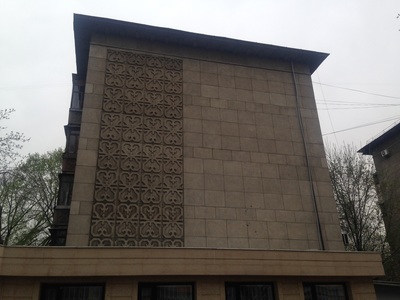 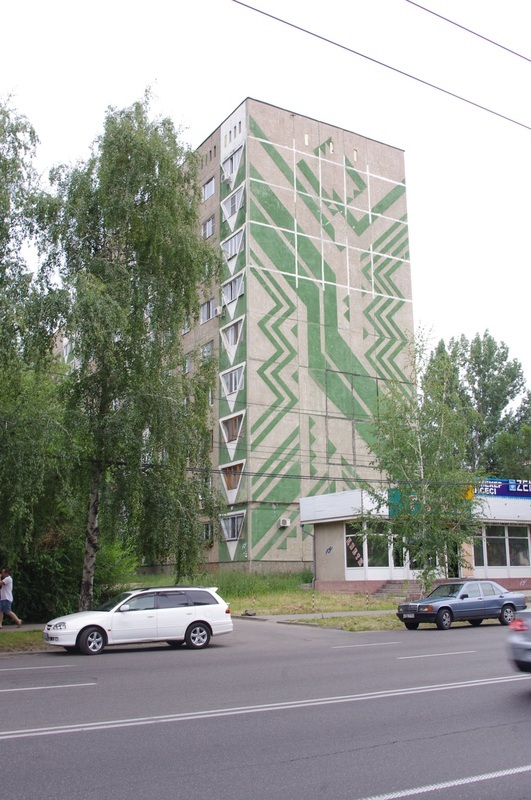 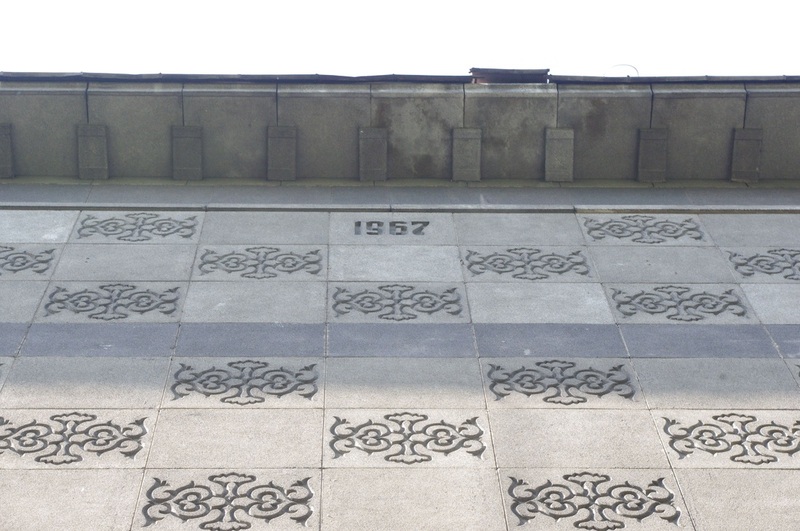 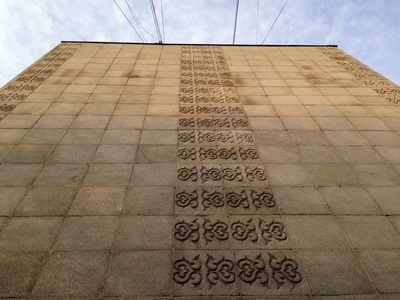 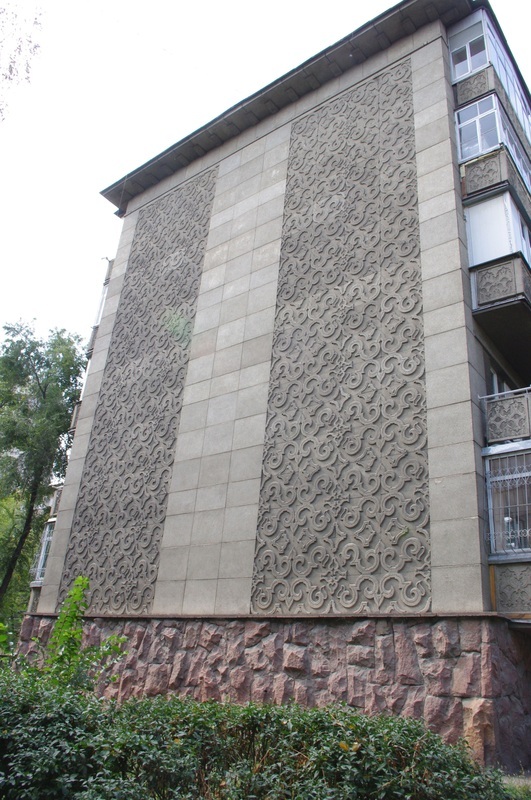 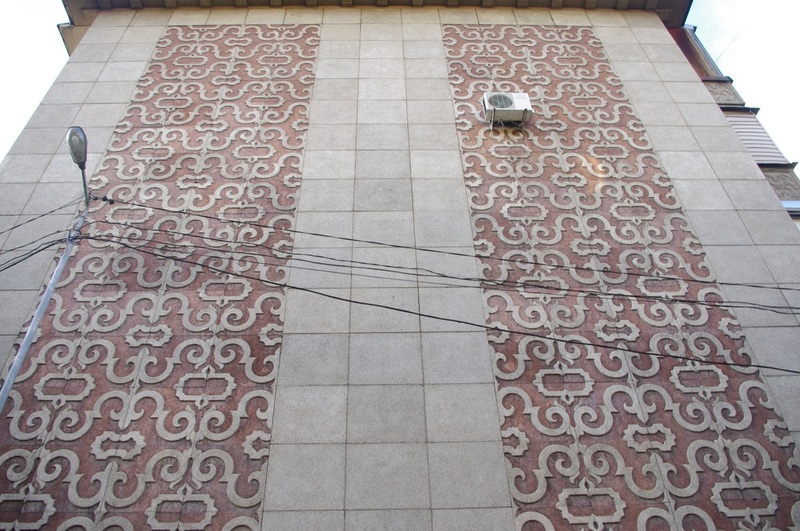 The previous generation of Khruschyovkas, which are harder to identify by model, also had decorative brandmauers, these ones often made out of concrete panels with huge Kazakh ornaments. 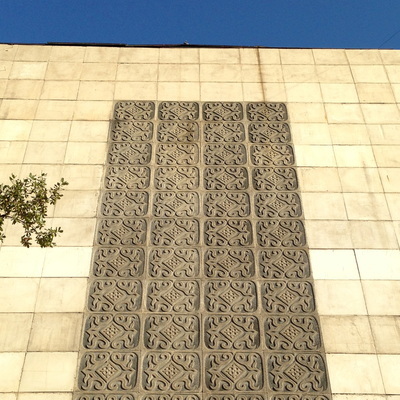 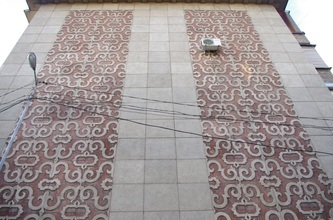 Sometimes these ornaments seem to be carved out of the concrete itself, likely using giant molds (a la the cement panels). Other times, the designs are pieced together from alternating grey concrete panels with ones that have been died oxidized red (a la the suburban masonry patterns.) The final work looks remarkably like two-tone pixel art.